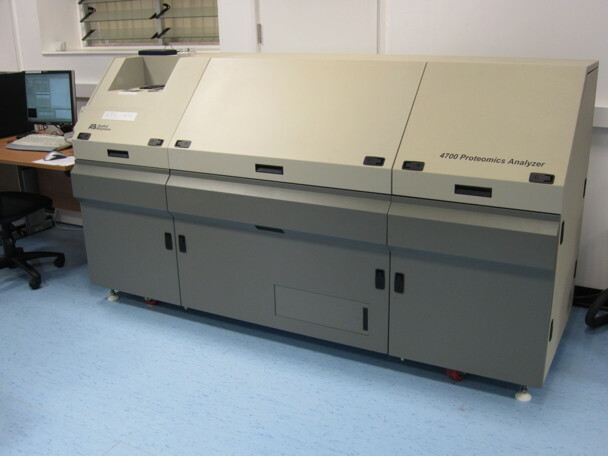 The 384 sample GeneTitan is a high throughput genotyper. 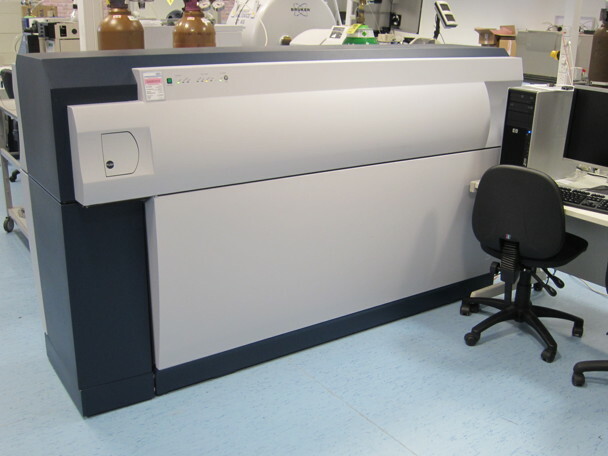 This platform offers a number of benefits over existing systems, for instance the 384 GeneTitan has the capability to process 24- 96- or 384 samples in parallel, enabling targeted SNP or gene expression analysis to be carried out at medium or high throughout levels, compared with the labour intensive single (eight at most) cartridge array formats that the Bristol Genomics Facility currently houses. 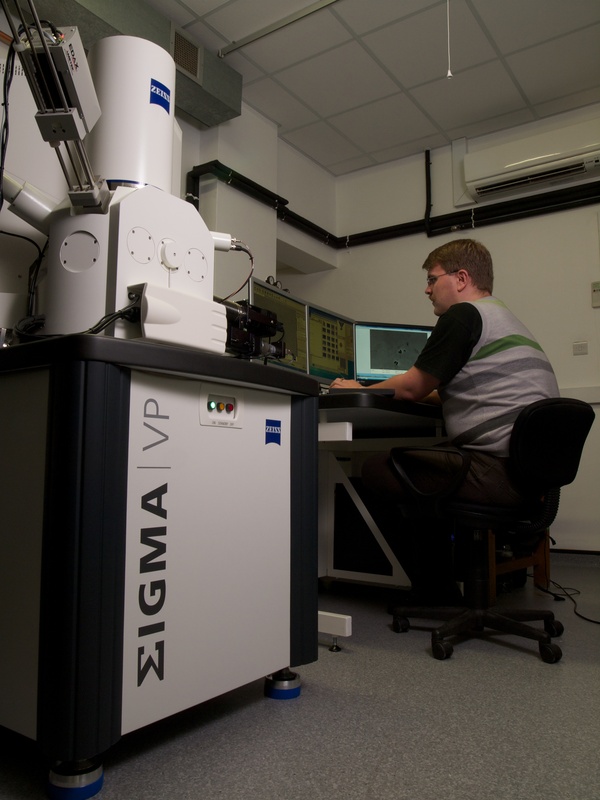 High resolution micromachining, etching, deposition & microscopy, incl secondary electron and backscattered electron SEM, Energy Dispersive X-ray analysis (EDX) and nanomanipulation. 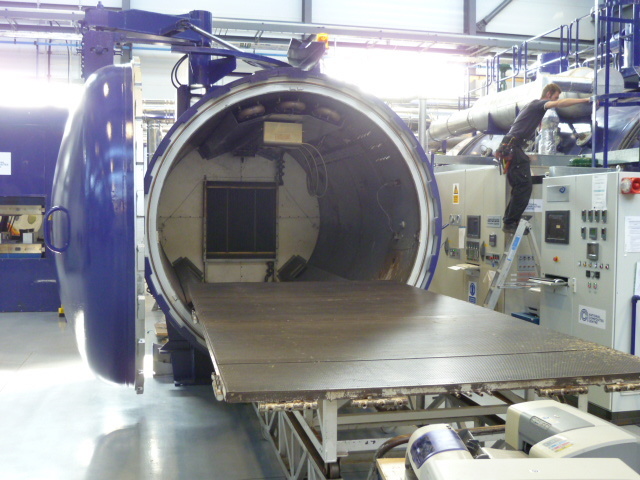 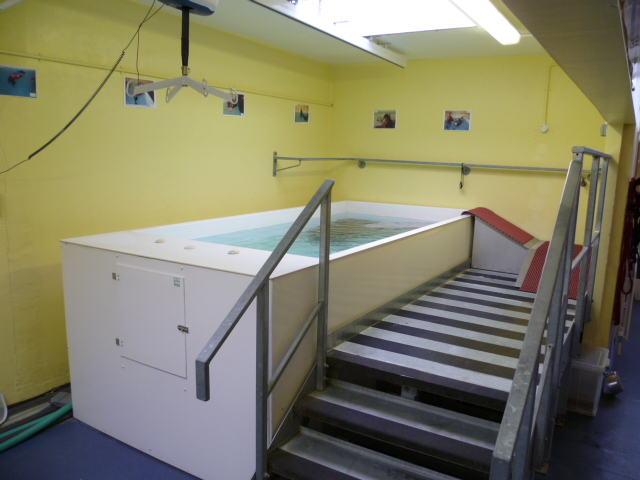 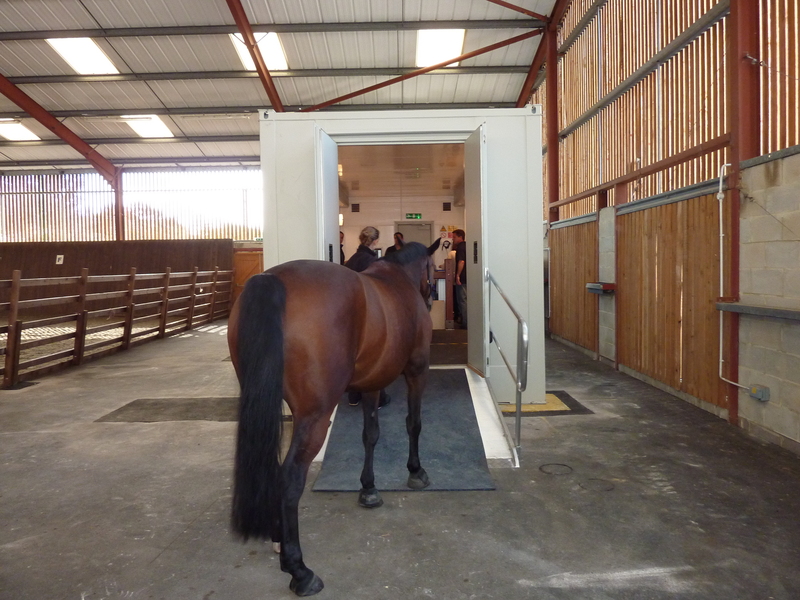 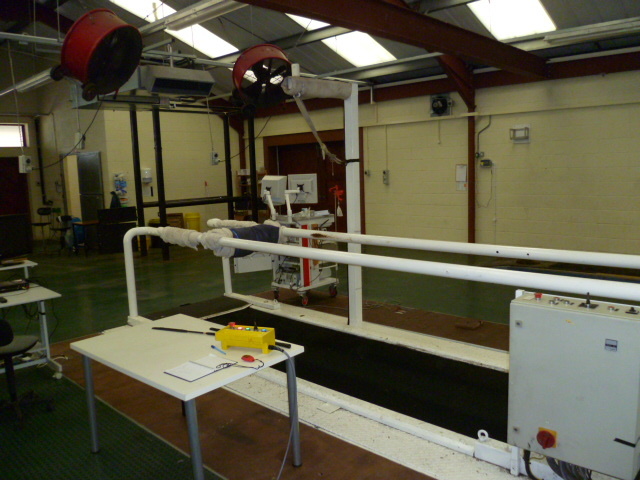 An MRI unit housed in the equine diagnostic centre for clinical use in diagnosing lower limb disease in horses By visualising slices through tissue MRI can quickly and precisely localise damage to both bone and soft tissues. 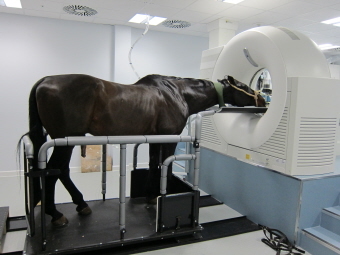 Standing MRI identifies the specific cause lameness in over 90% of cases. 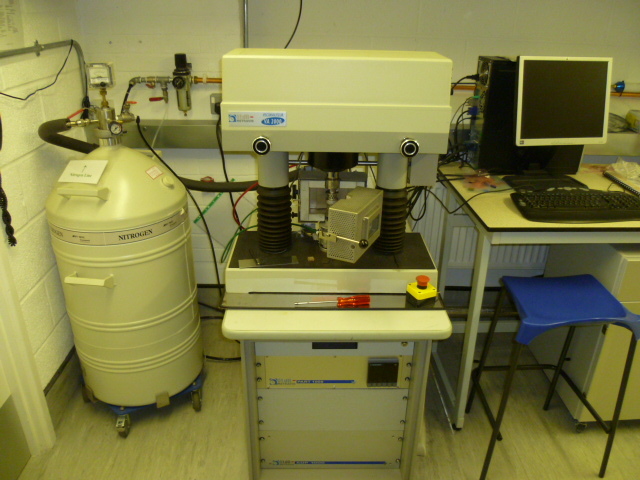 The ThermoElectron MAT95 XP-Trap is a double focussing dual sector (reverse Niers Johnson geometry)-ion trap hybrid mass spectrometer and is the most versatile of all the instruments the lab maintains. 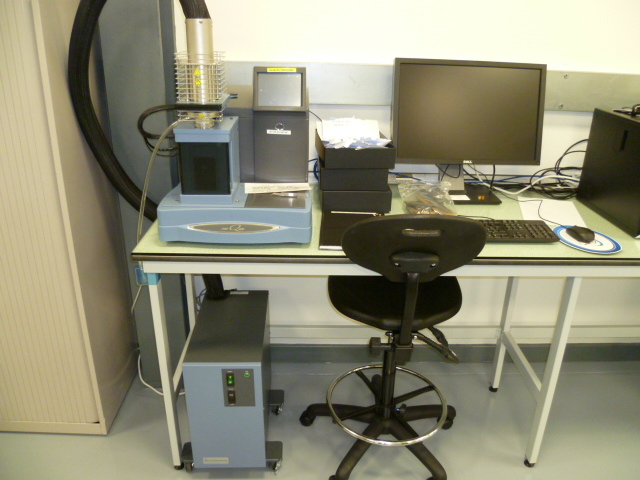 It is equipped with both GC (EI and CI +/-) and HPLC interfaces (electrospray and APCI) and is capable of both low and high resolution measurements and MIKES. 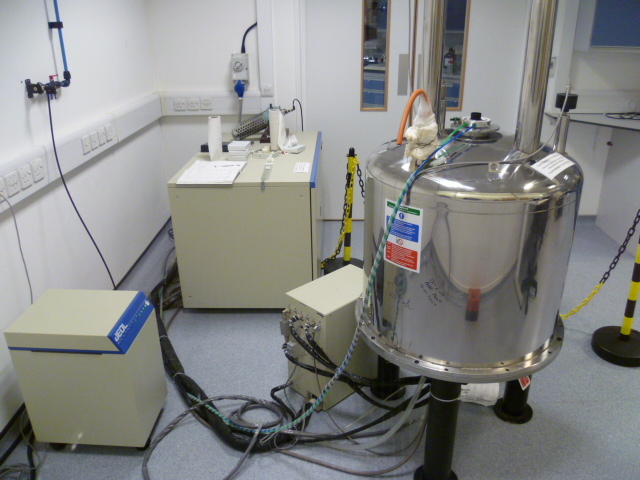 The addition of an ion trap also enables MSn expermients to be performed. 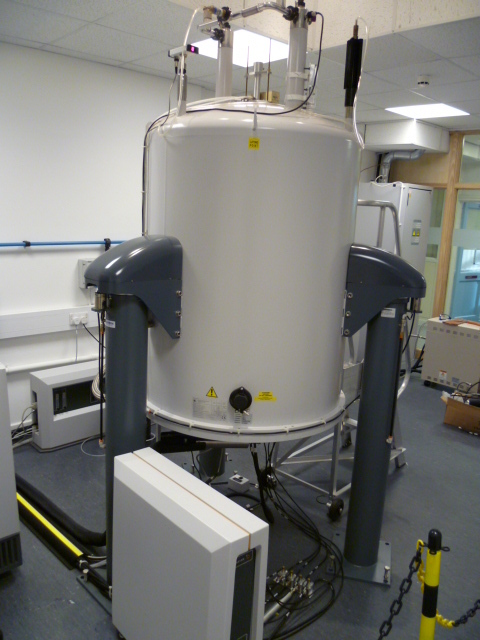 High resolution sector mass spectrometer. 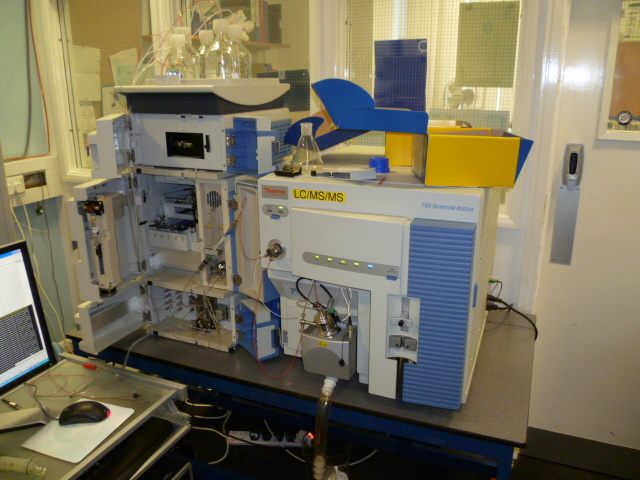 High resolution sequential (MSn) mass spectrometer. 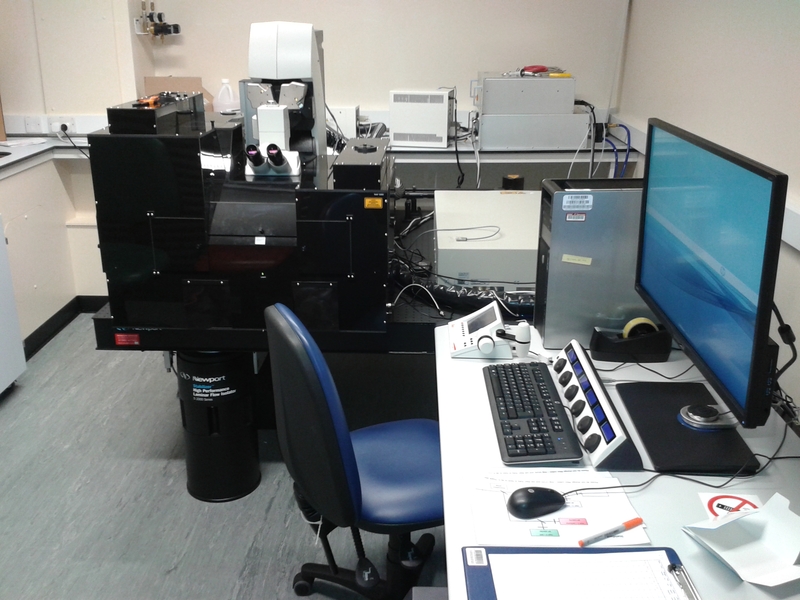 The latest generation Leica confocal with hybrid detectors alongside PMTs, providing increased sensitivity. 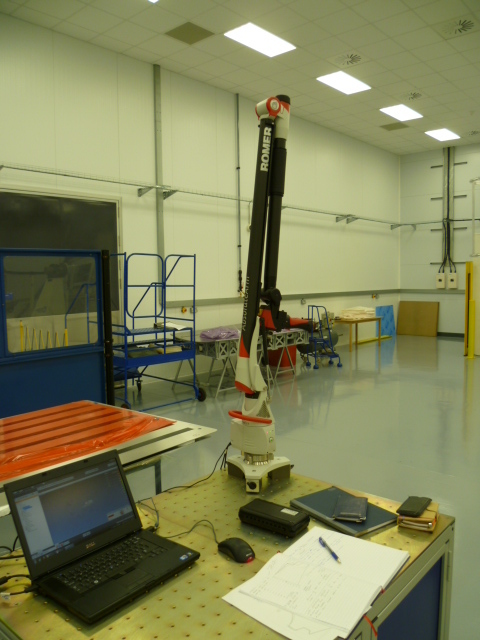 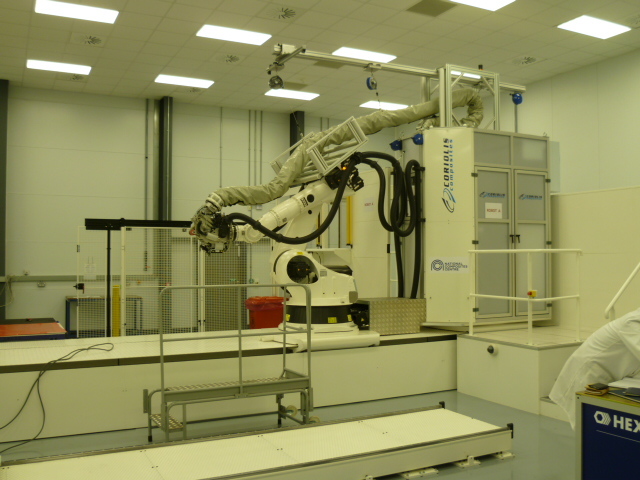 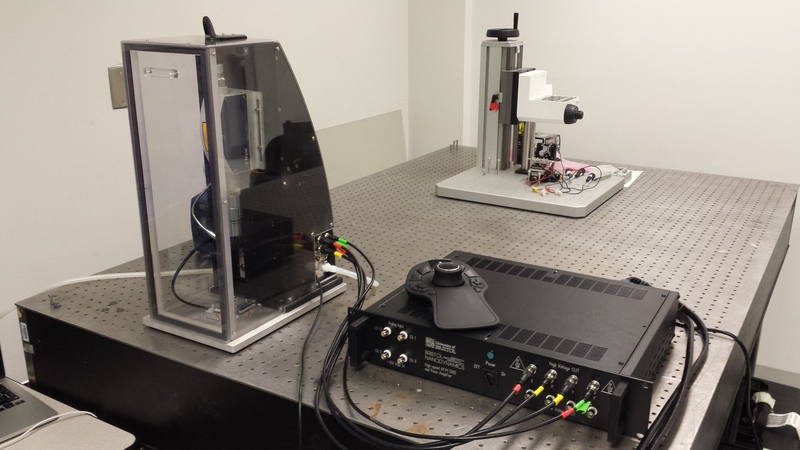 A second ‘resonant’ scanner enables image acquisition at higher frame rates. 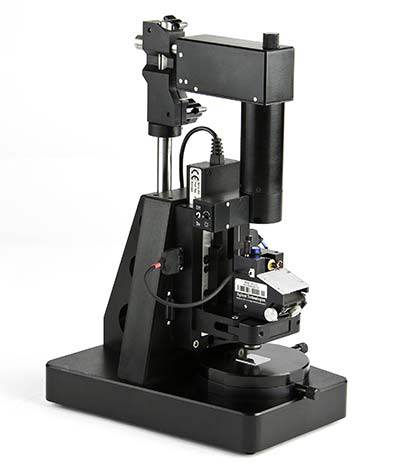 These extra features provide advantages for live cell imaging. 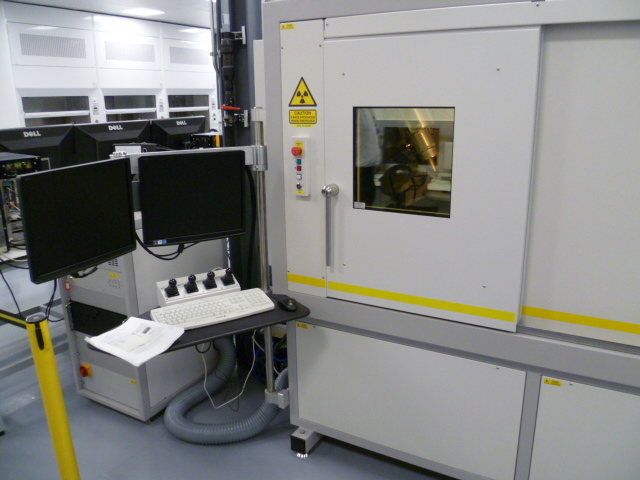 Equipped with five lasers (9 available lines) - Ar laser (458, 476, 488, 496, 514 nm lines), yellow, orange and red lasers (561, 594, 633 nm lines) and a 405 nm diode laser. 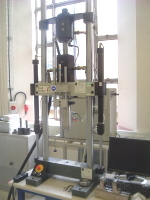 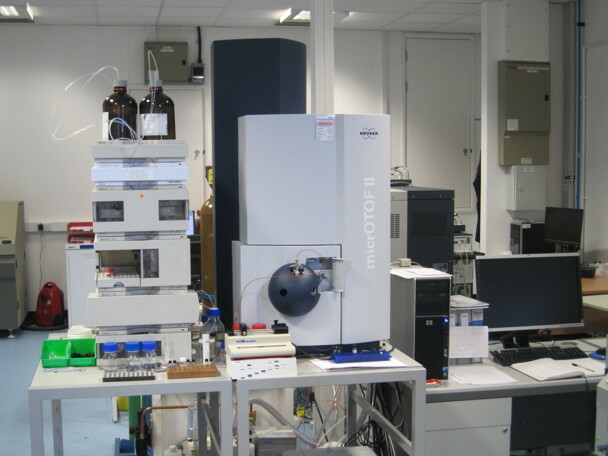 A dedicated high pressure liquid chromatograph system, with autosampler and PDA detector, connected via an electrospray interface or atmospheric pressure chemical ionisation interface to a triple quadrupole mass analyser. 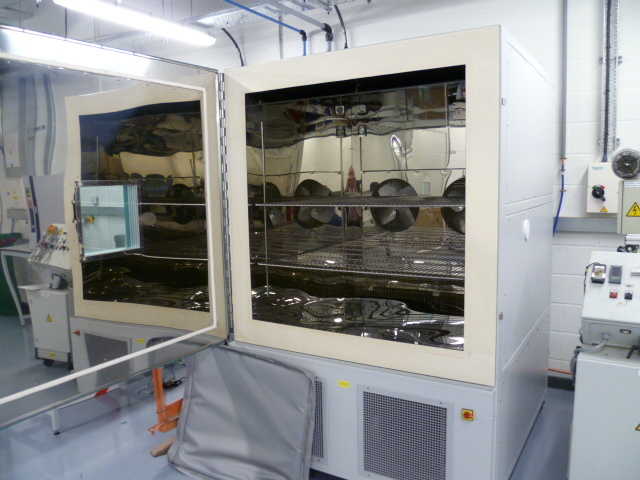 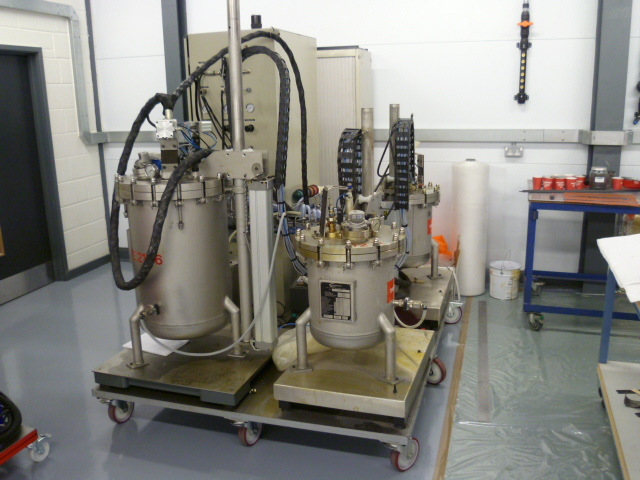 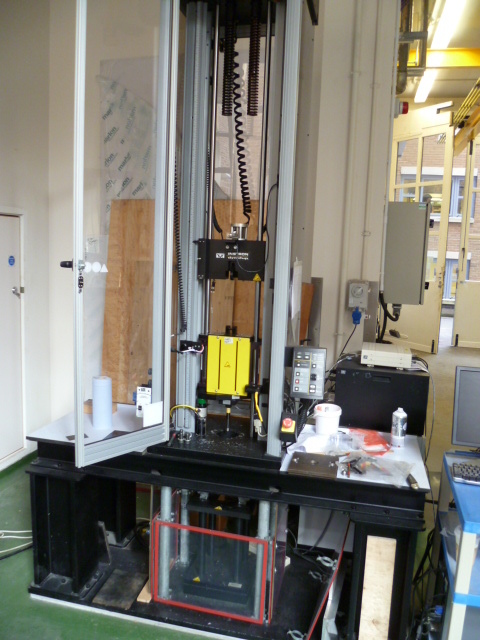 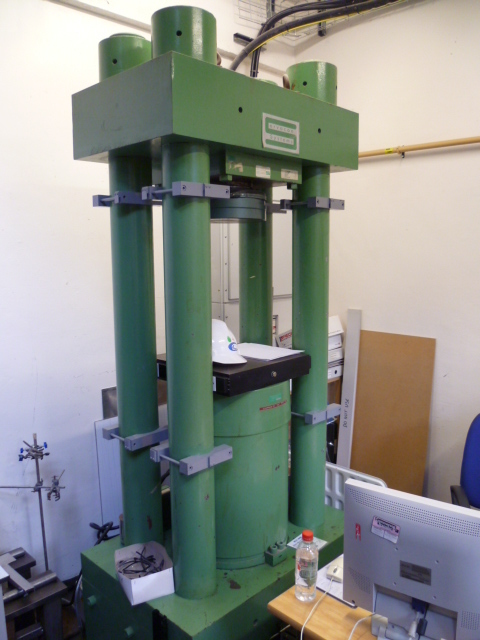 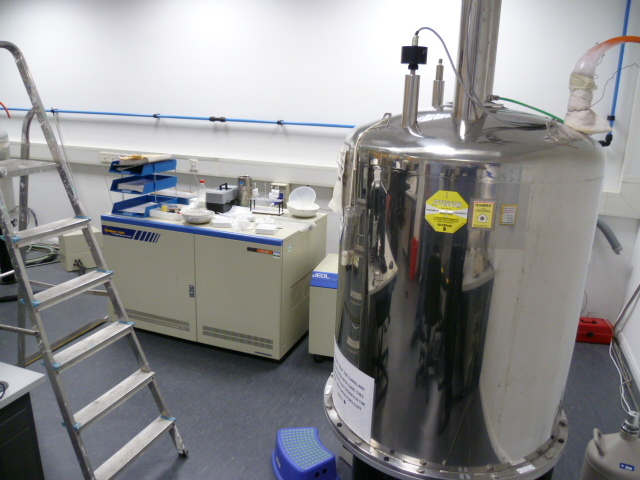 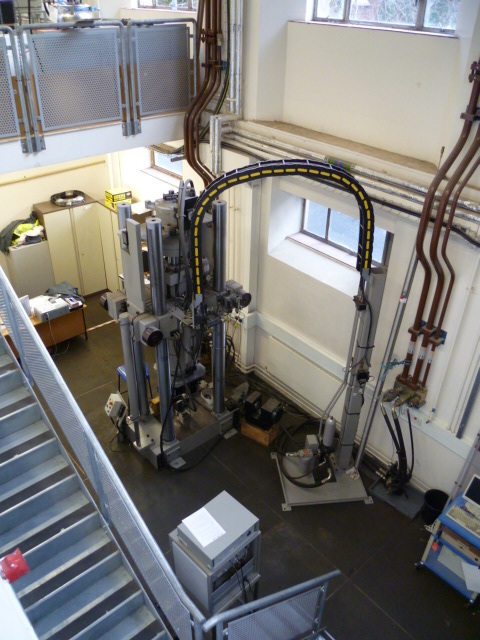 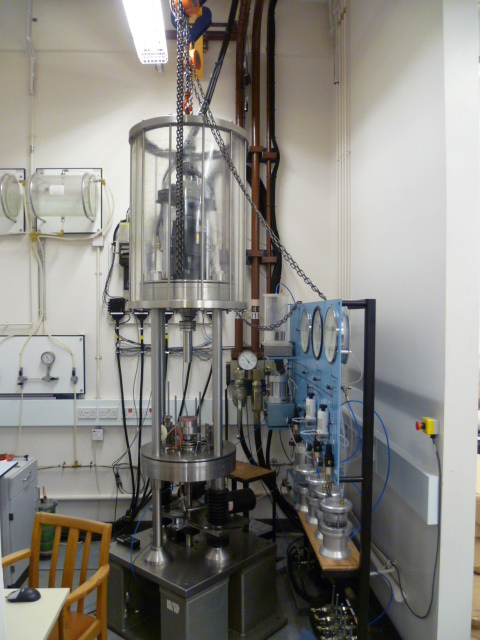 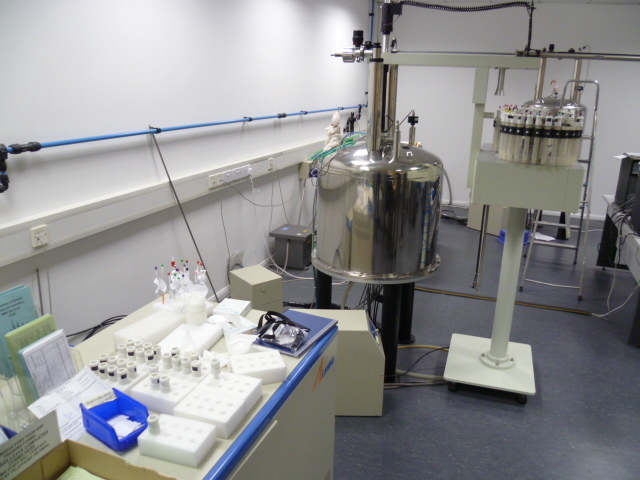 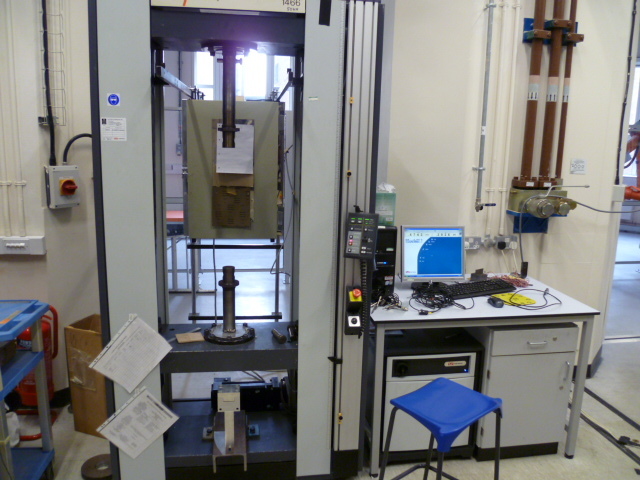 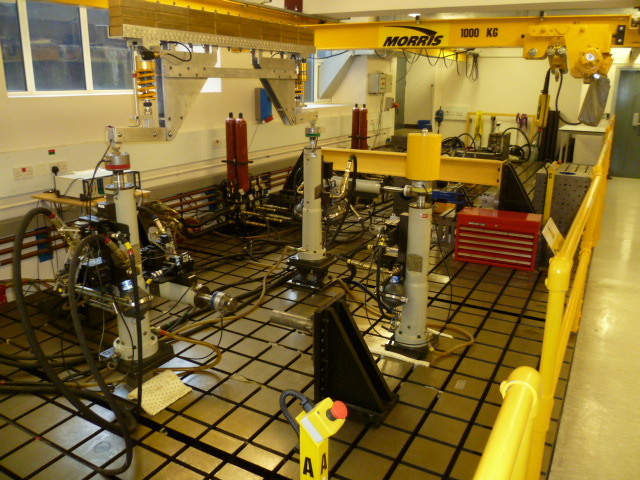 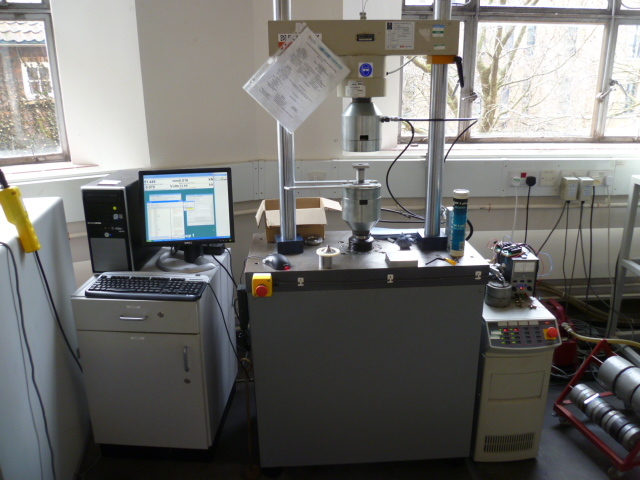 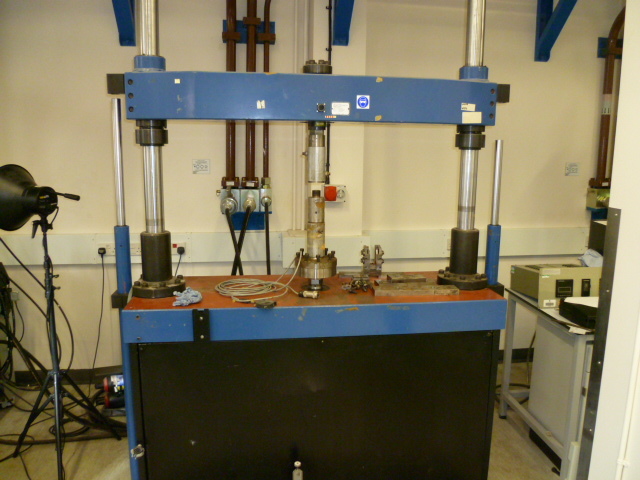 Typically setup to run normal phase separations for determination of the TEX86 palaeotemperature proxy. 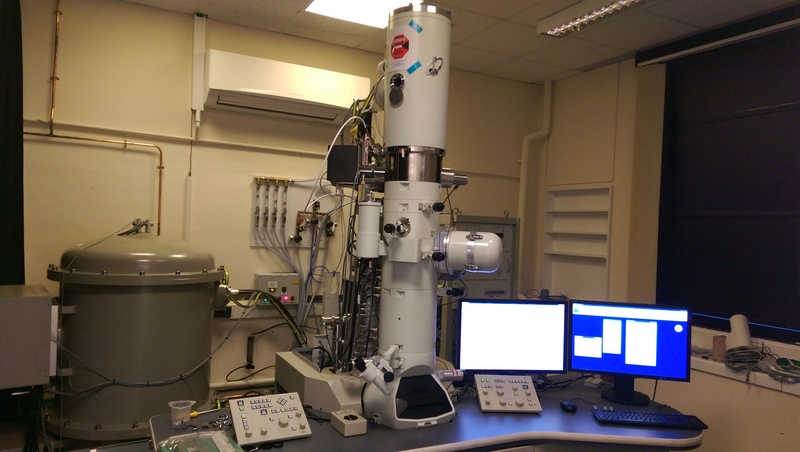 "Making use of a newly discovered physics, our contact mode high-speed atomic force microscope (HS-AFM) is the fastest in the world by several orders of magnitude. 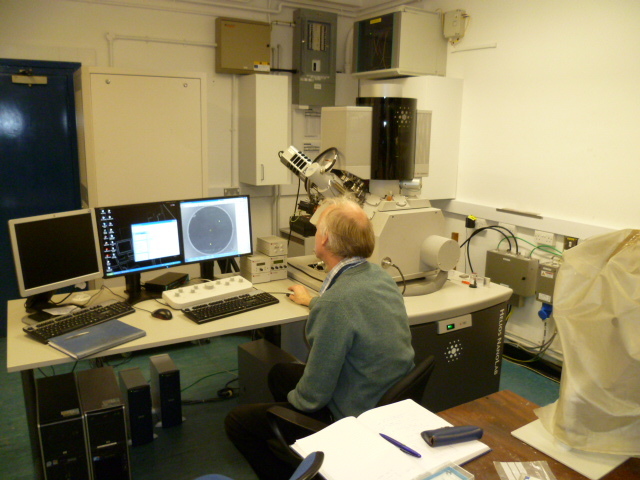 The HS-AFM moves the sample in a raster pattern and engages a sharp tip with the surface in order to map the samples topography with nanometre lateral and sub atomic height resolution over millimetre sized areas. 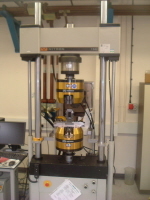 The tip can be thought of as a finger passing across a surface, not only is it possible to map the height of the surface, it is also possible to map the local stiffness, thermal and electrical properties at the same time. 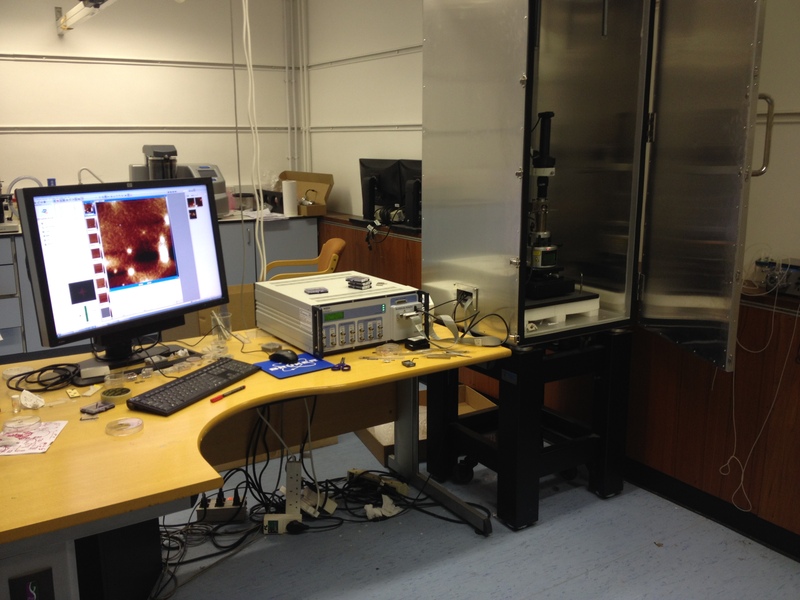 Typical applications: The HS-AFM typically collects data at 2 million pixels per second, however this can be increased to 10 million pixels per second if required. 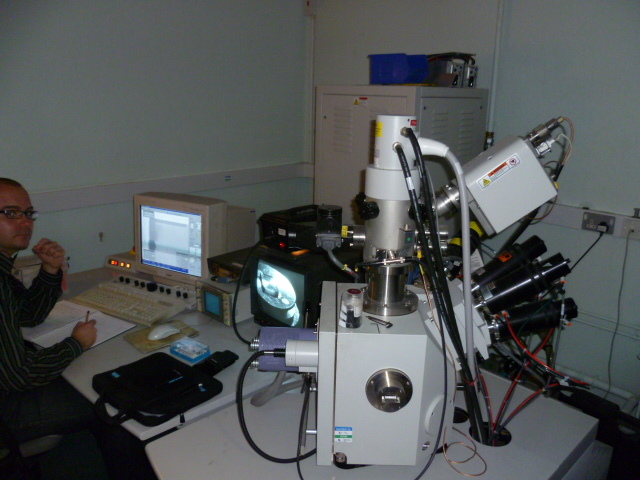 These pixel rates allow the HS-AFM to image millimetre sized areas in under a day, a task that would take a conventional AFM in excess of a year of continuous imaging. 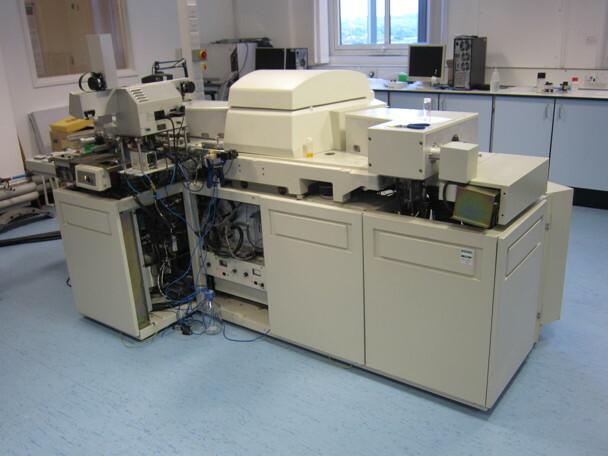 Examples include: vast sampling of nanostructures for unbeatable sample statistics and measurement certainty, and mapping of nano-structures across large areas. 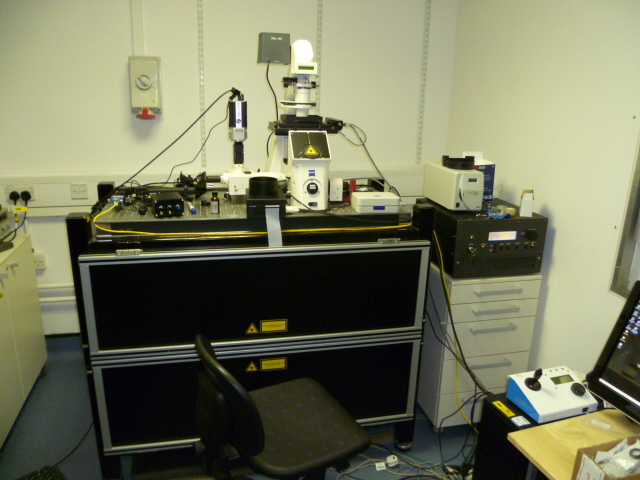 In addition to imaging large areas we can use the high pixel rate of the instrument can be used to observe nano and micro scale dynamic processes with millisecond temporal resolution. 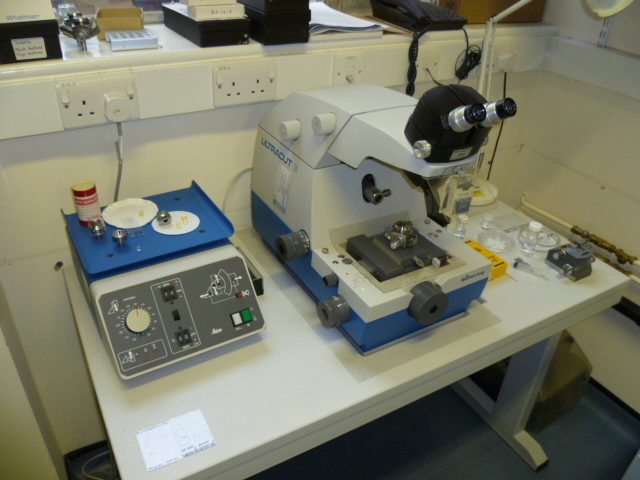 Examples include: corrosion of metallic surfaces, formation of crystals and salts, and bio-molecular processes." 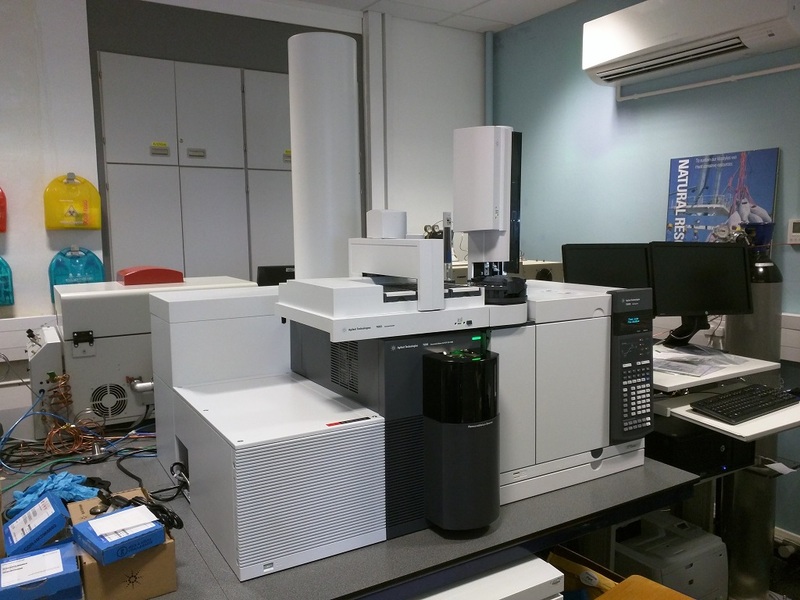 The Agilent 7200B Series GC/Q-TOF is a tandem MS based instrument that combines the features of a GC-MS system with an ability to perform MS/MS analyses and accurate mass determinations. 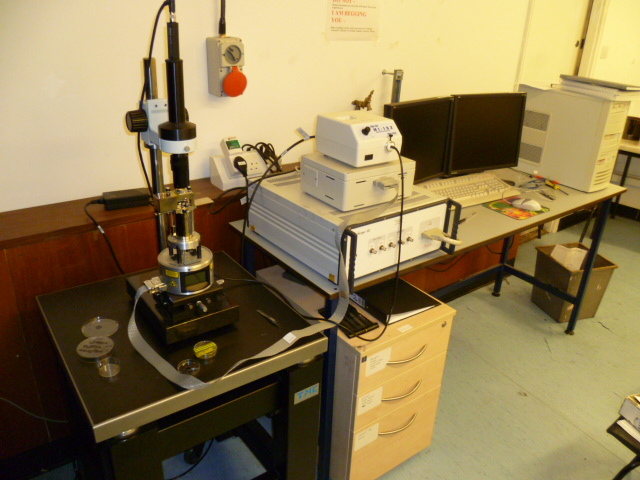 Scan rates of up to 50 Hz are achieveable and EI(+) and CI(+/-) ionisation modes are available. 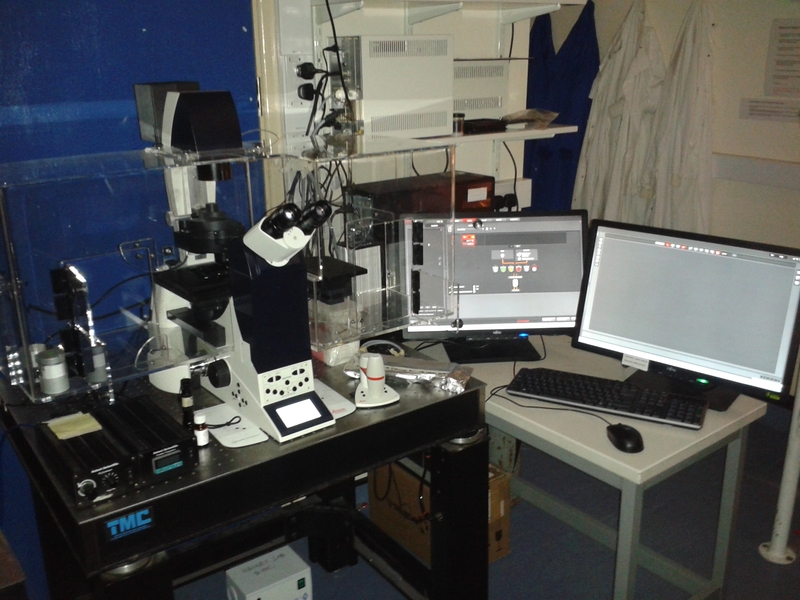 Leica LASX live cell imaging workstation with DMI6000 inverted epifluorescence microscope with adaptive focus control (maintains focus during timelapse imaging). 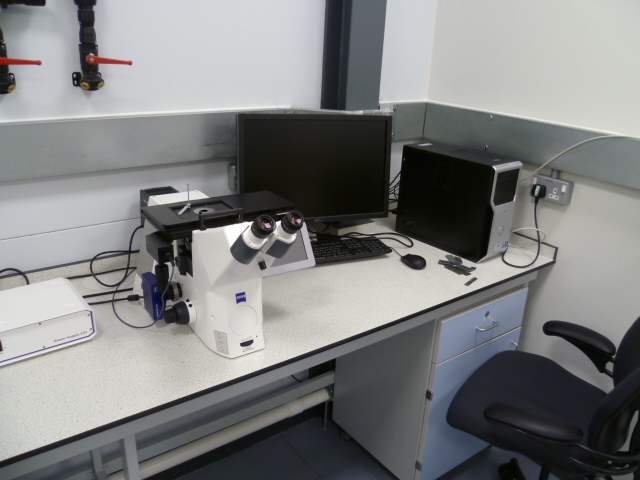 Equipped with Leica DFC365FX monochrome CCD camera (1392x1040 6.45µm pixels, 8 or 12 bit), motorised stage and Solent incubator for multi-site timelapse imaging (fluorescence, phase contrast, DIC). 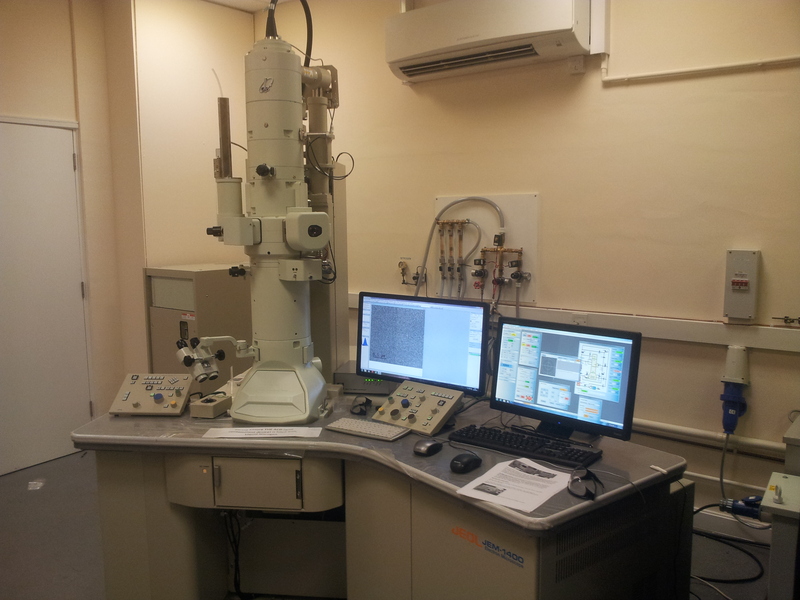 High resolution micromachining, etching, deposition & microscopy, TEM sample preparation and sectioning, IC modification. 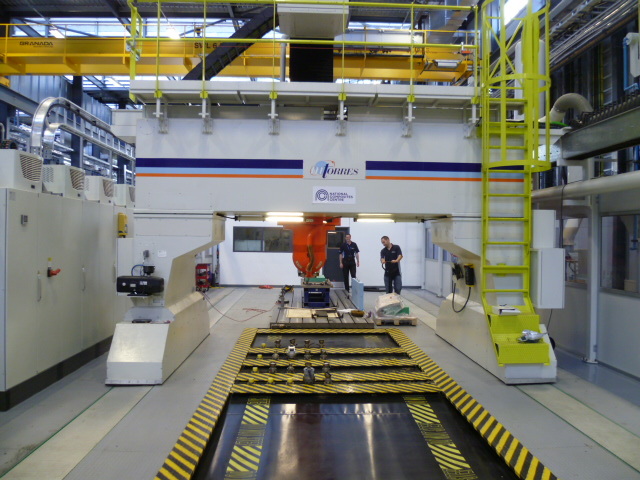 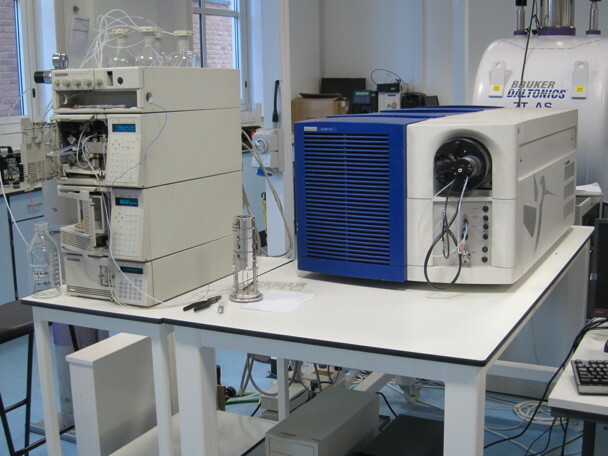 High resolution time-of-flight mass spectrometer. 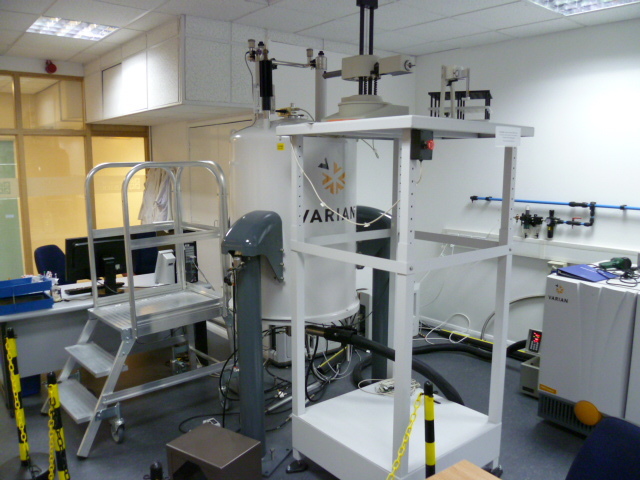 Wide angle X-ray scattering (WAXS), crystalline materials. 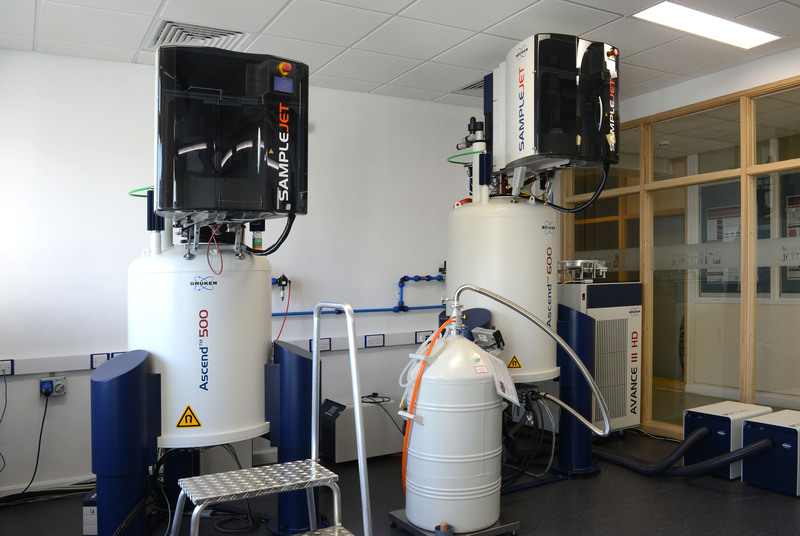 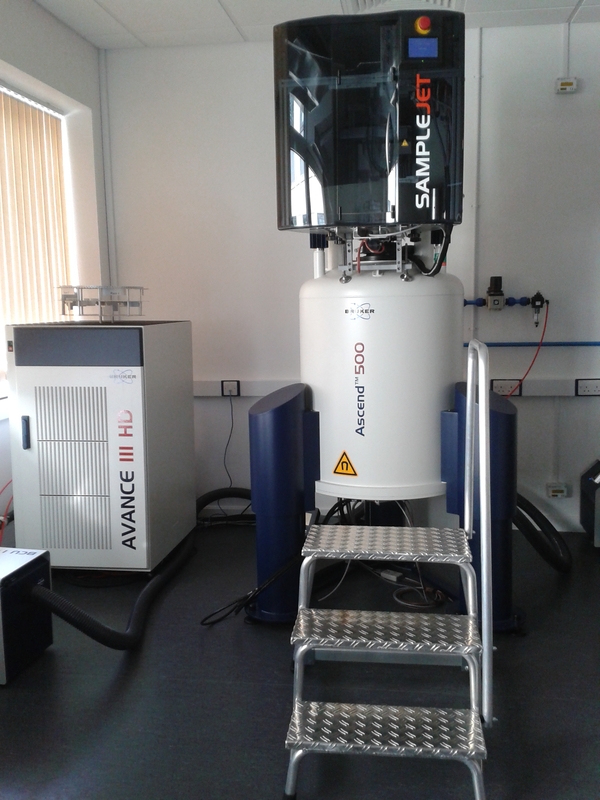 NMR Spec 600 MHz, solution state NMR, Biological/Protein NMR, Triple resonance cryo-probe. 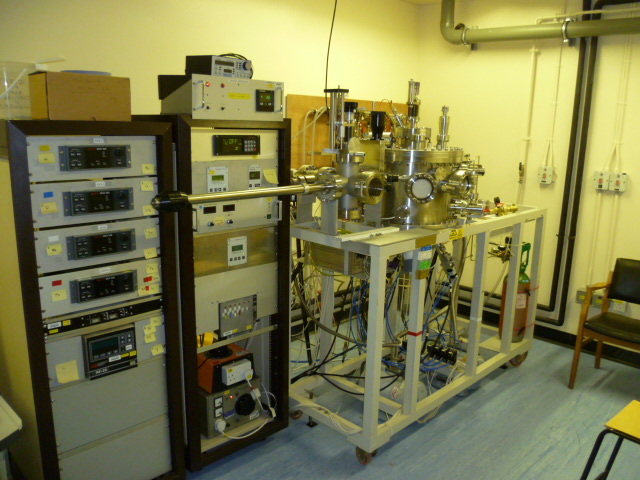 The signal to noise for proton on a standard ethyl benzene (0.1%) sample is between 5500 and 7000:1. 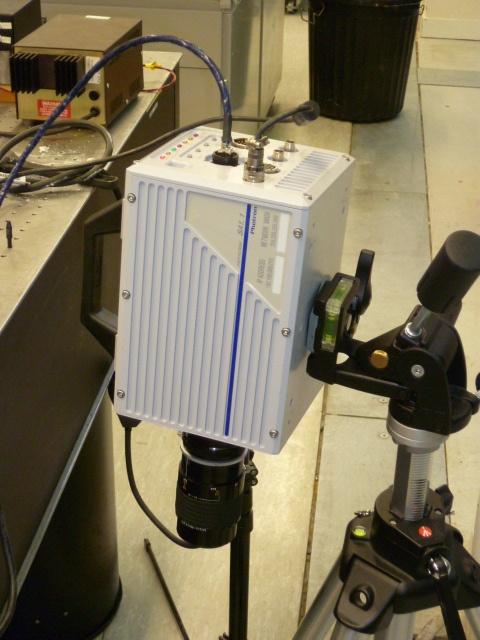 This compares to 1280:1 on the INOVA 600 and 500:1 at 500 MHz. 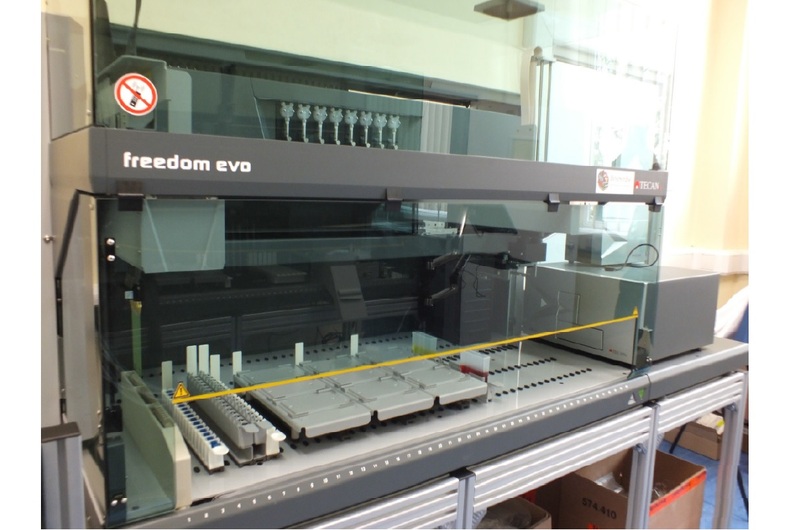 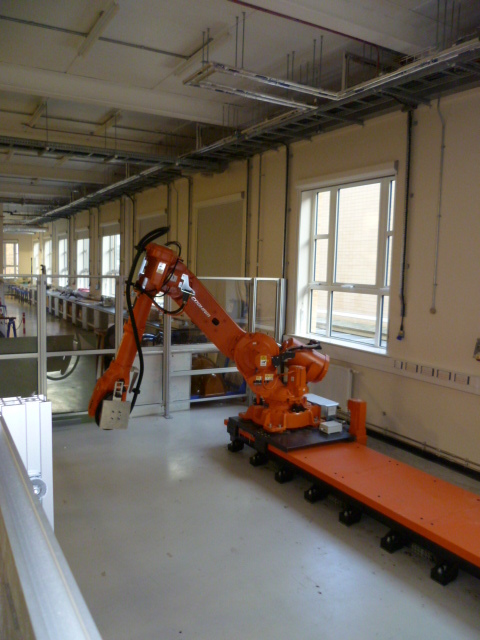 Liquid handling robotics platform for molecular biology, cloning and small scale protein work. 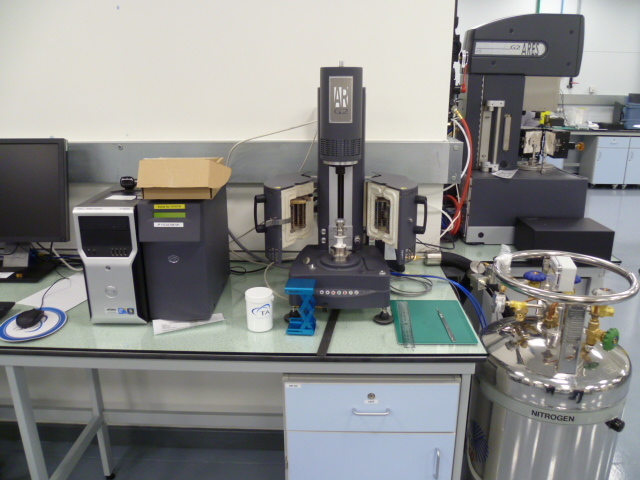 High resolution hybrid ion mobility time-of-flight mass spectrometer with Nano-Acquity UPLC and Advion Nanomate Triversa automated nanospray ion source. 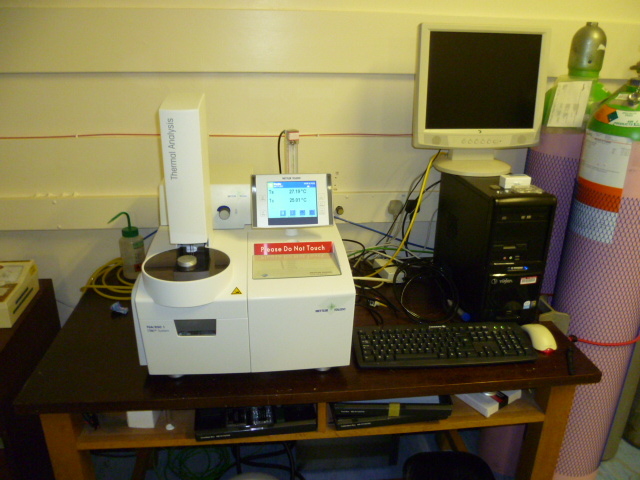 For single crystal diffraction analysis of crystals of proteins, macromoleules and small molecules. 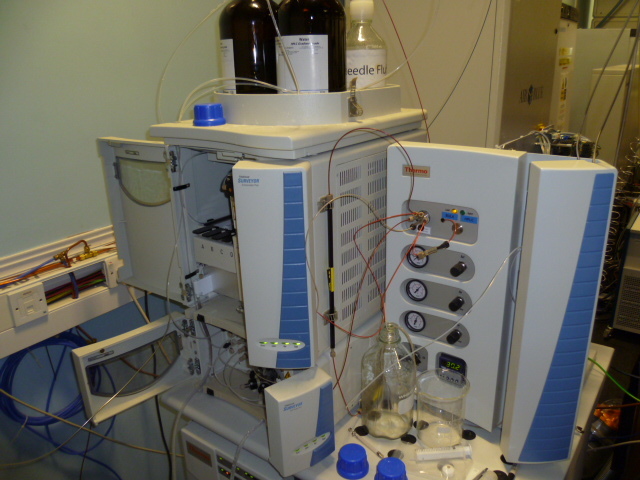 Determination of absolute structure possible for organic molecules. 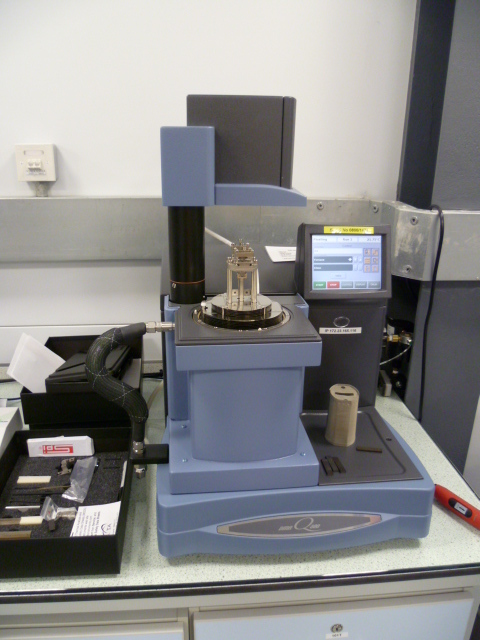 For single crystal diffraction analysis. 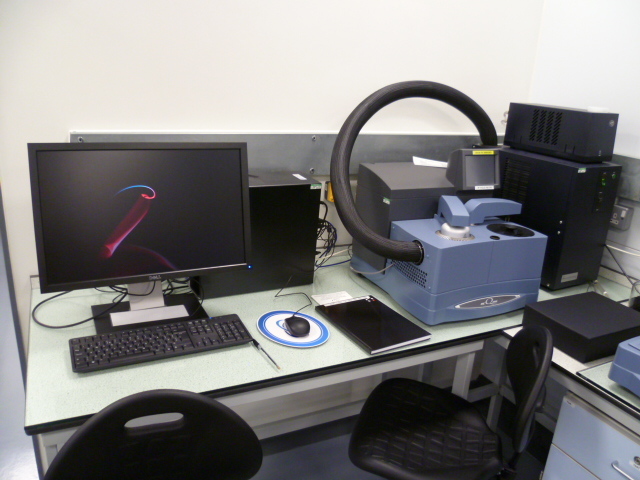 Sofware can also handle twinned samples. 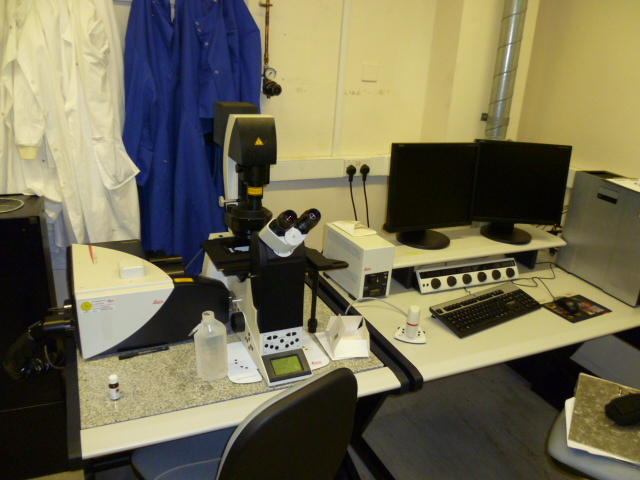 Leica confocal with white light laser enabling excitation tuning, spectral scanning and gated imaging. 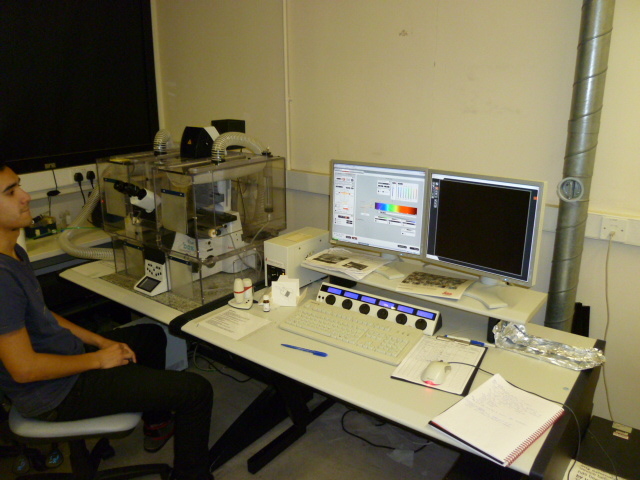 HyD SMD detectors and picoquant software enable fluorescence lifetime imaging microscopy (FLIM) and fluorescence correlation spectroscopy (FCS). 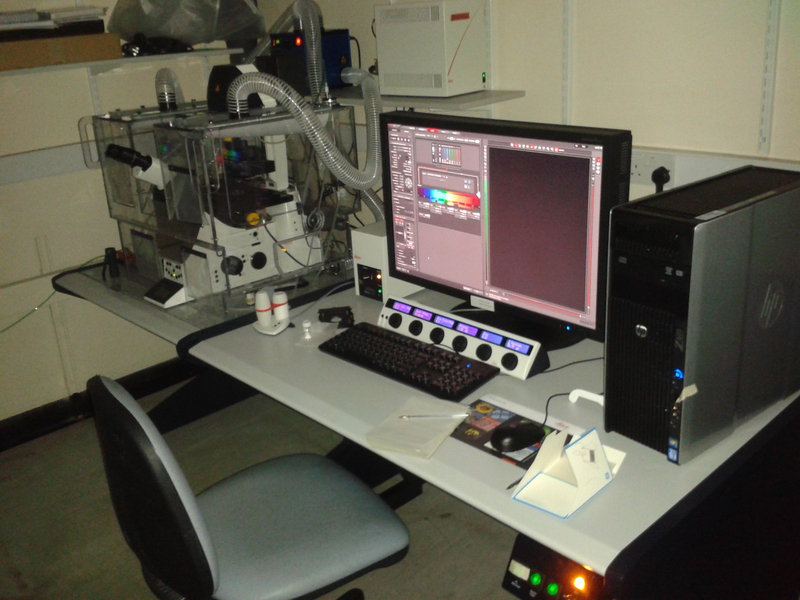 Gated STED unit and two depletion lasers (592 and 660nm) enable multi-colour super-resolution imaging. 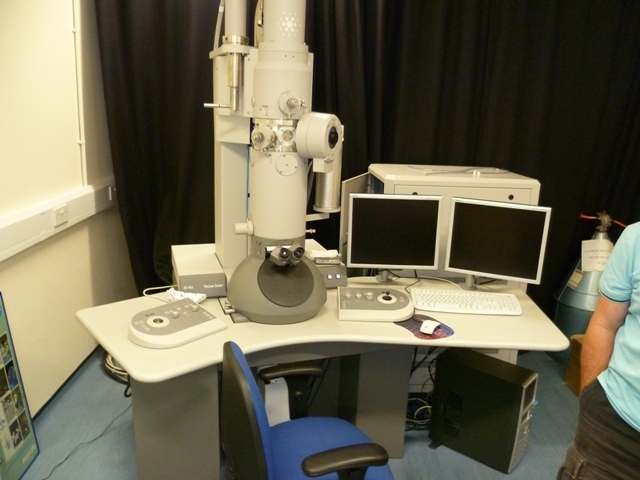 On a DMi8 inverted microscope. 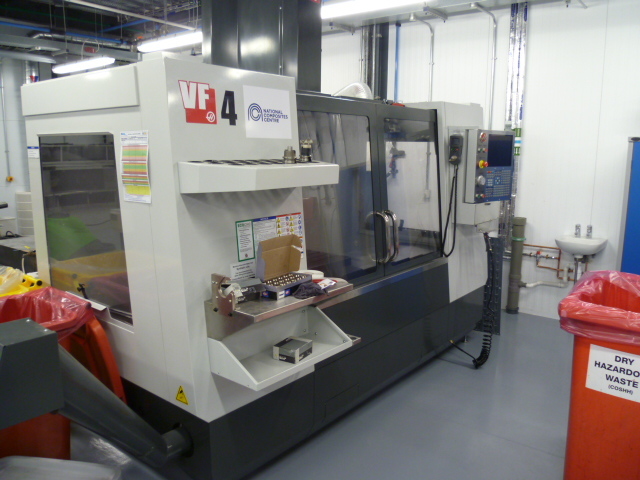 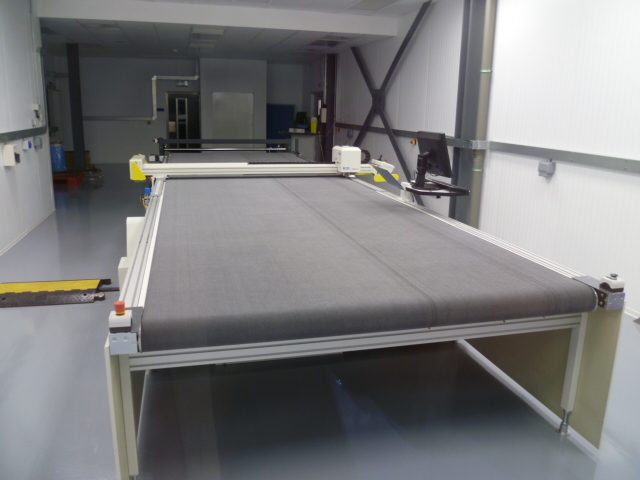 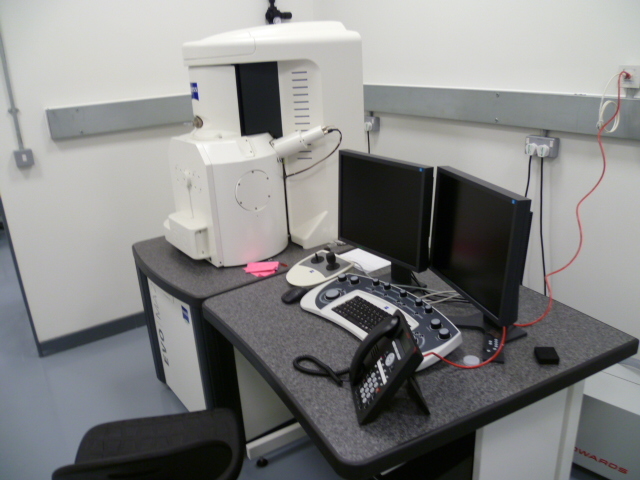 Equipped with 405 and 442 nm lasers in addition to the WLL (470-670nm) tuneable laser. 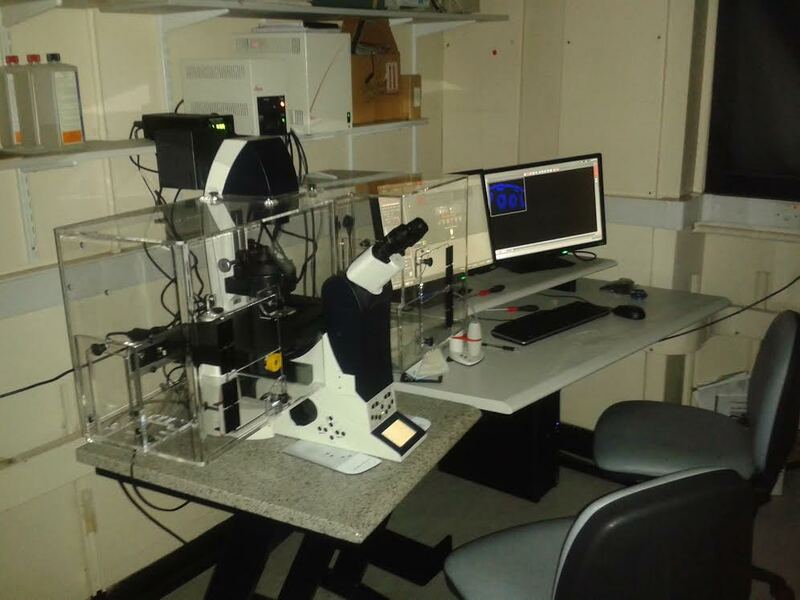 Leica LASX live cell imaging workstation with DMI8 inverted epifluorescence microscope with adaptive focus control (maintains focus during timelapse imaging). 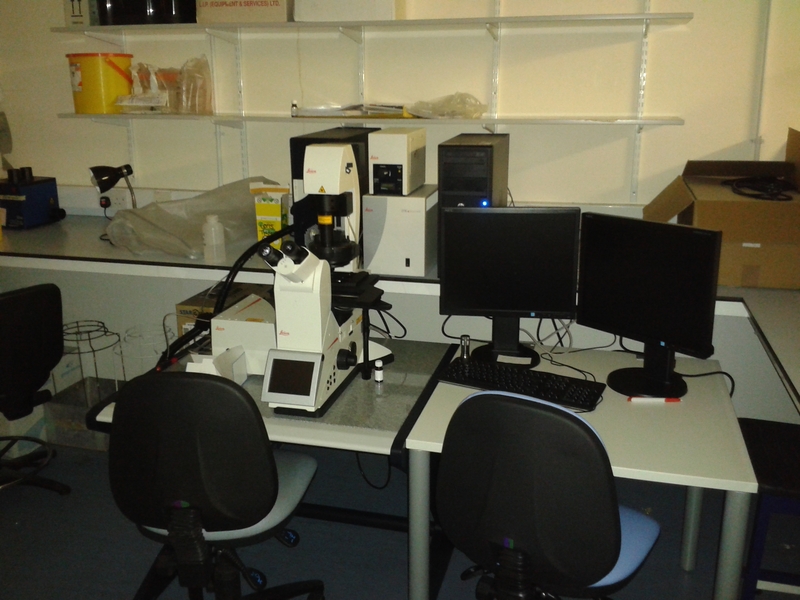 Equipped with 2 cameras: Andor iXON 897 Ultra back-illuminated EMCCD (512x512 16µm pixels, 16 bit) and Andor Neo sCMOS (2560x2160; 6.5µm pixels, 12 or 16 bit), motorised stage and PeCon incubator for multi-site timelapse imaging (fluorescence, phase contrast, DIC). 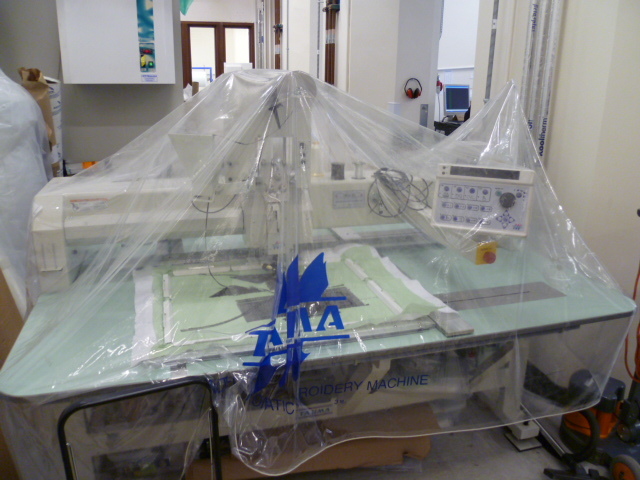 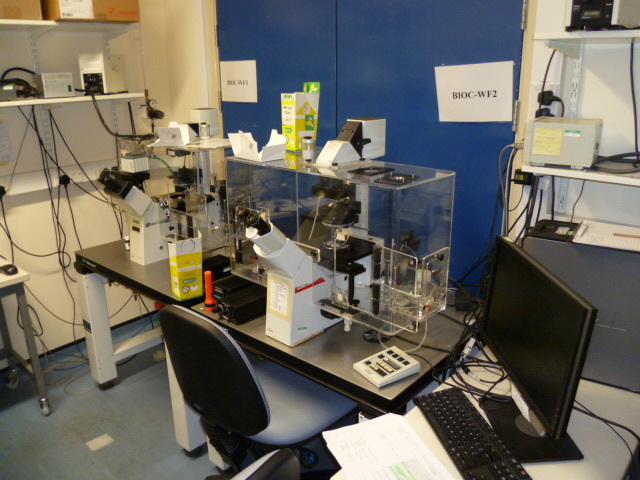 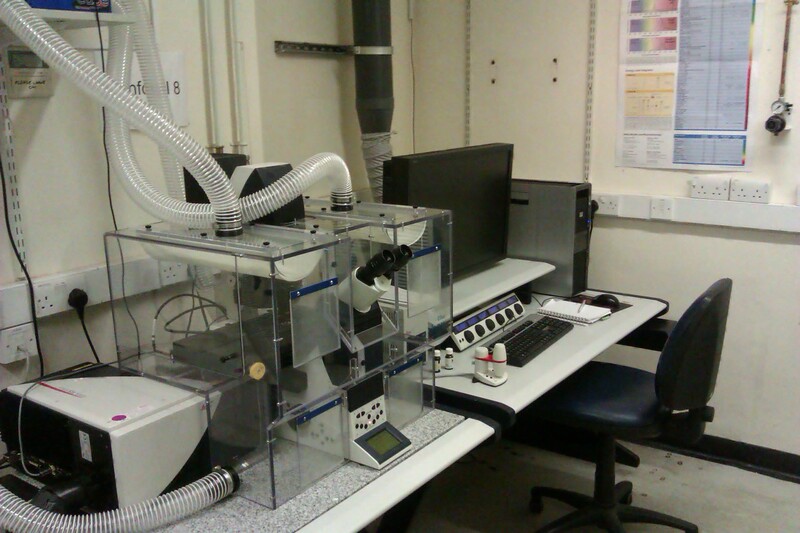 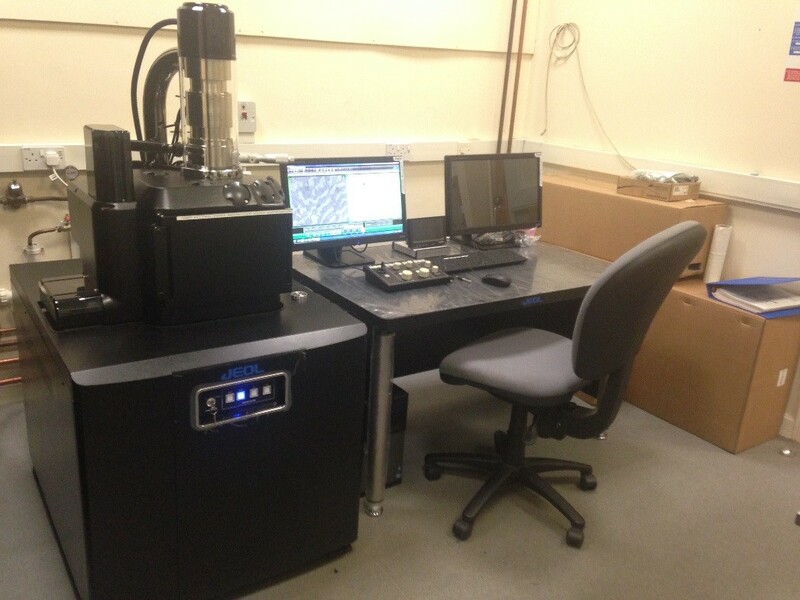 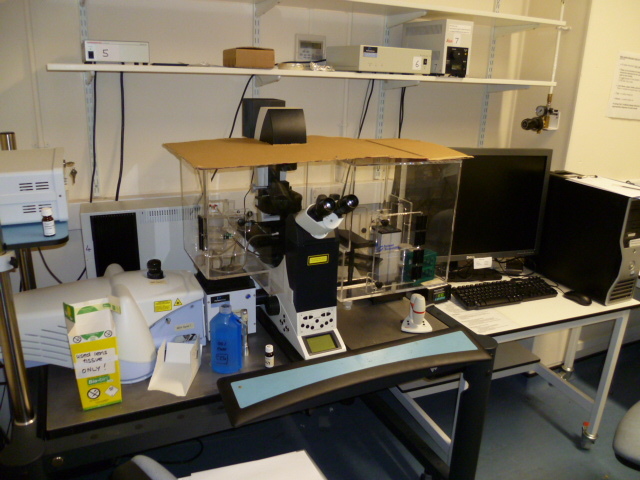 Set up specifically for live cell imaging in combination with microfluidics apparatus. 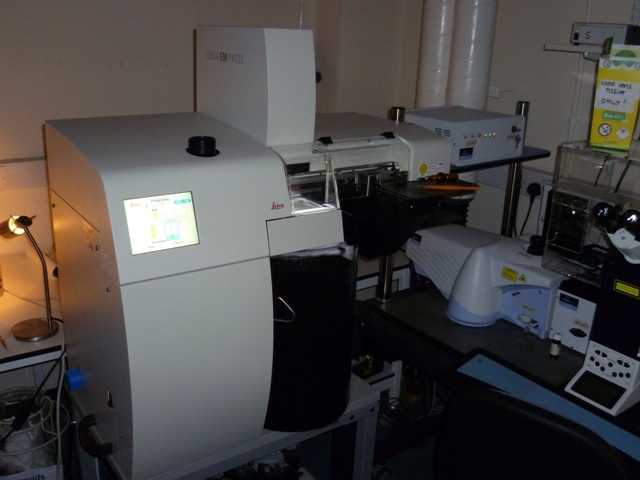 Leica AM TIRF MC (multi-colour) system for total internal reflection fluorescence microscopy or wide-field imaging. 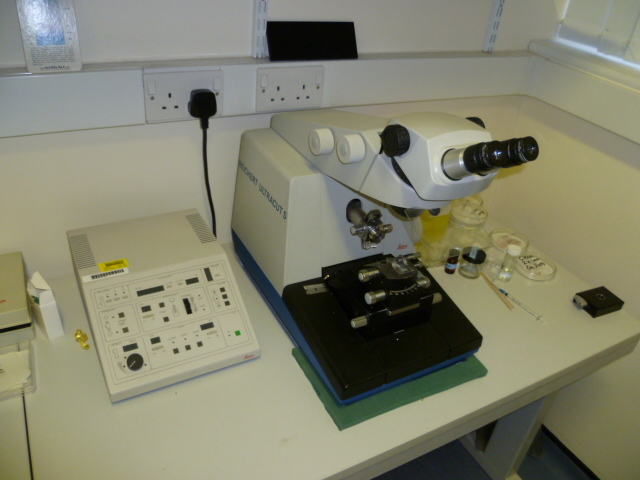 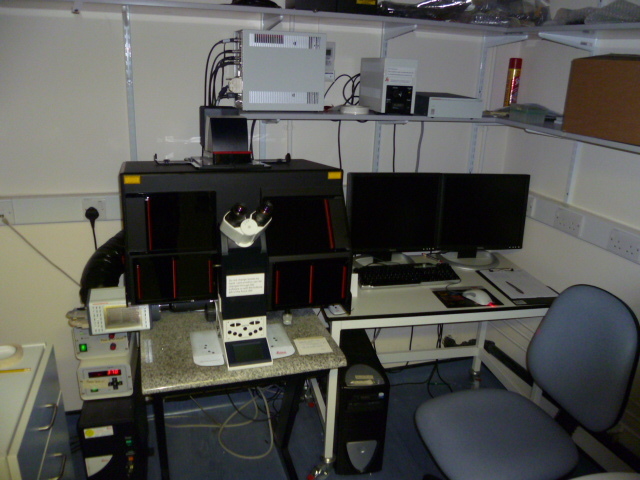 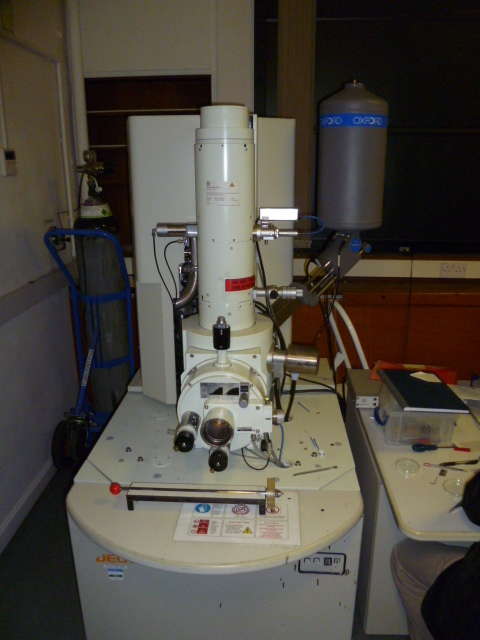 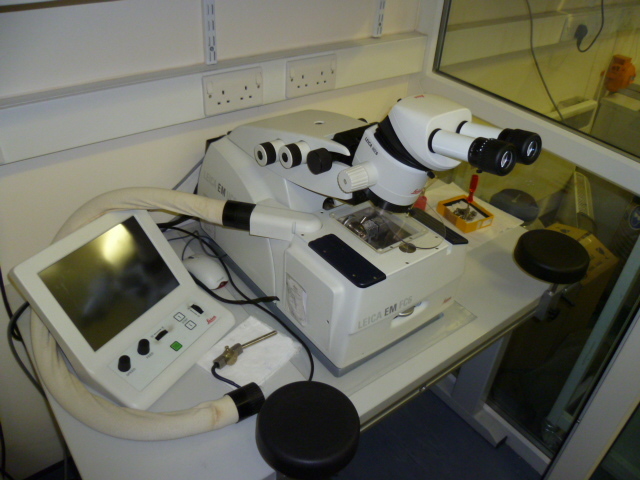 System attached to a Leica DMI 6000 inverted epifluorescence microscope with DIC available for some lenses. 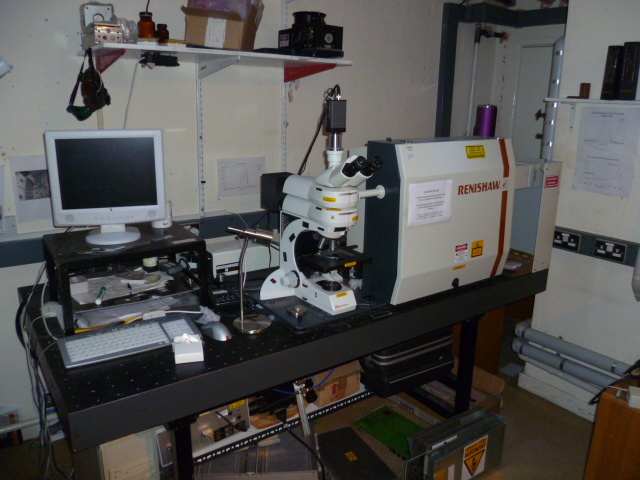 Simple selection of TIRF angle and rapid switching between laser lines (405, 488, 561nm). 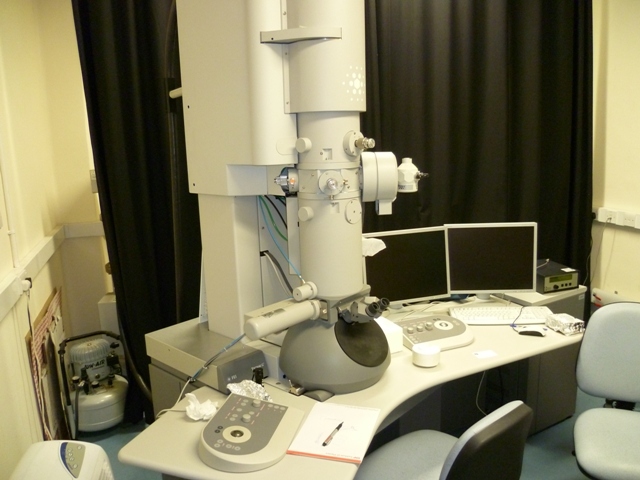 With Hamamatsu C9100-13 back-thinned EM-CCD camera. 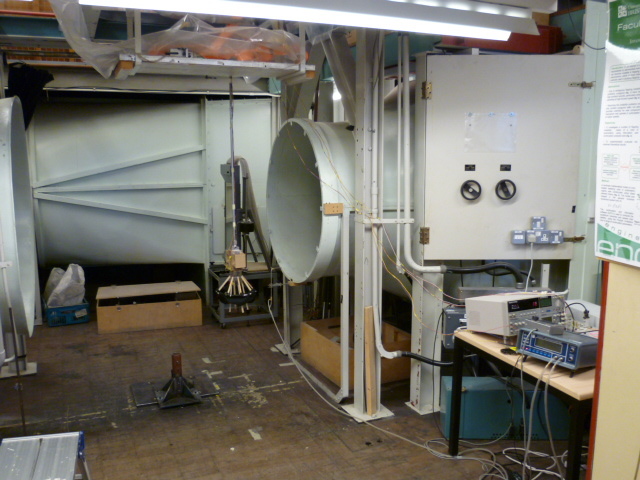 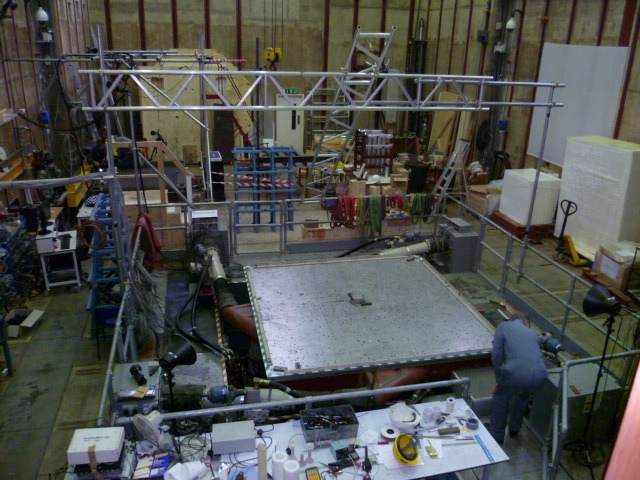 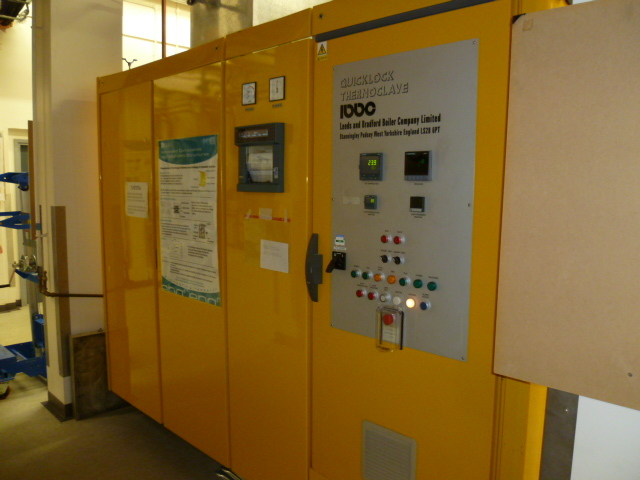 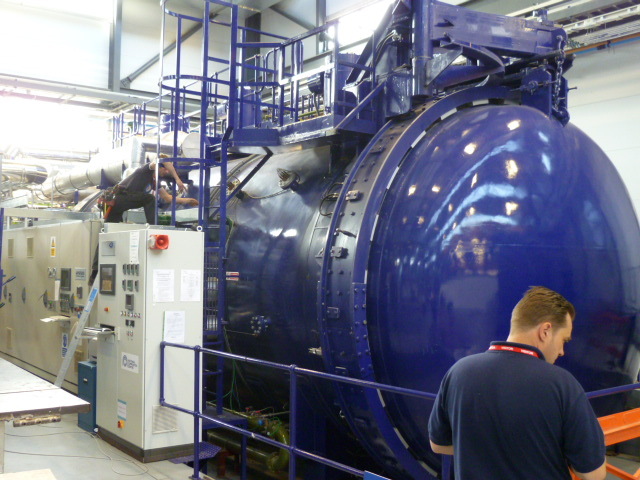 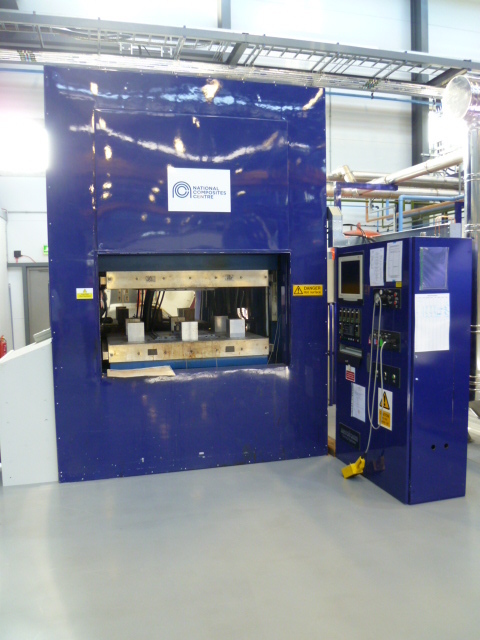 Temperature control chamber. 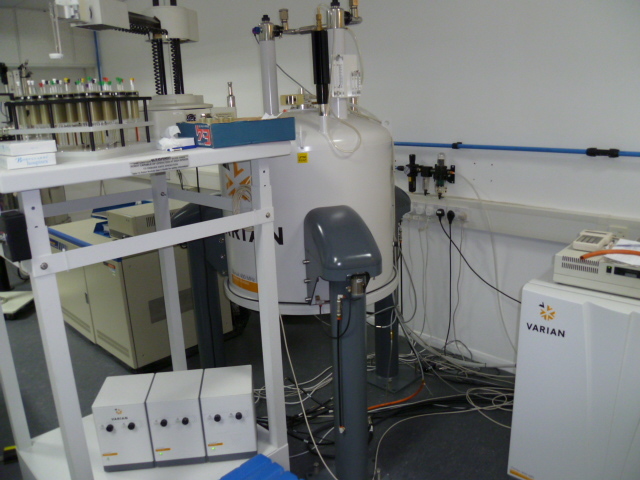 Matrix-assisted laser desorption/ionisation time-of-flight tandem mass spectrometer. 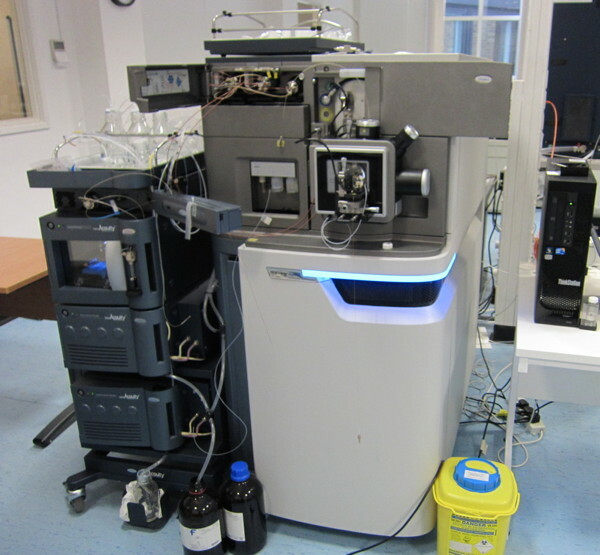 High resolution matrix-assisted laser desorption/ionisation time-of-flight tandem mass spectrometer with MALDI imaging capabilities. 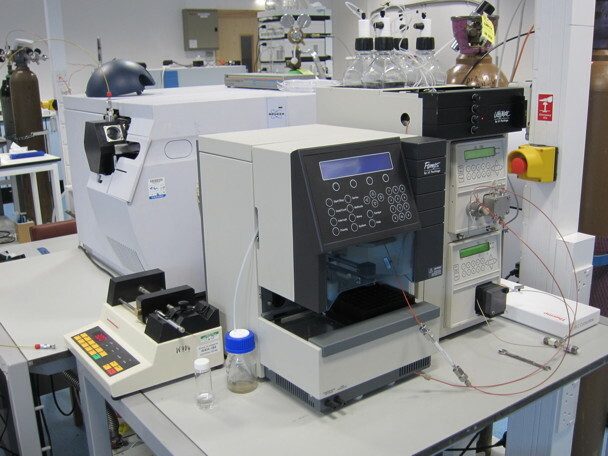 A cutting edge piece of instrumentation that enables the user to separate a mixture of compounds by liquid chromatography and then determine their individual d13C values as they elute from the chromatographic system via an online oxidation process. 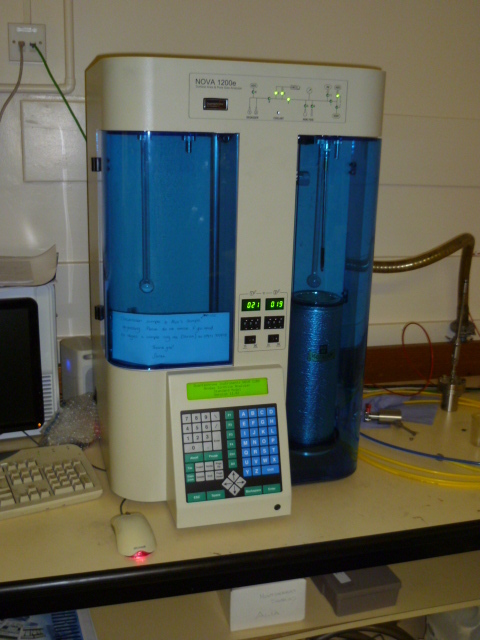 The only caveat is the the mobile phase must be aqueous with no organic buffers. 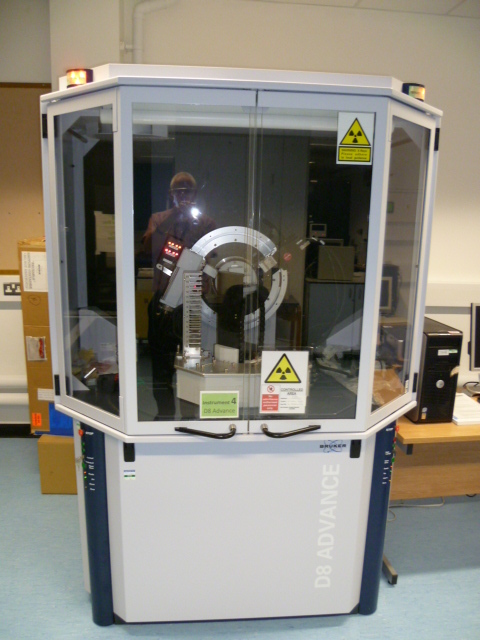 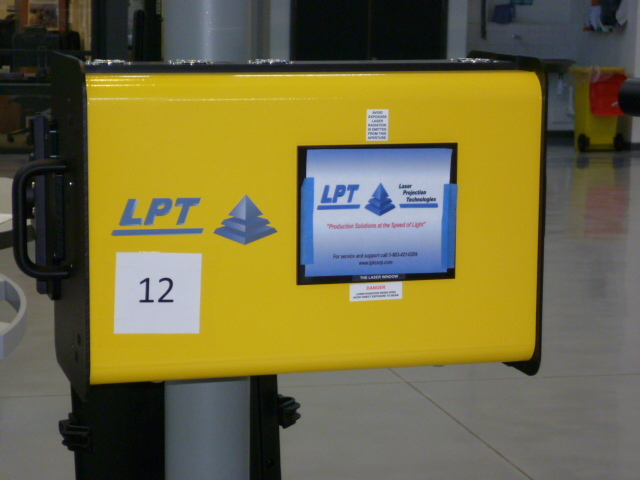 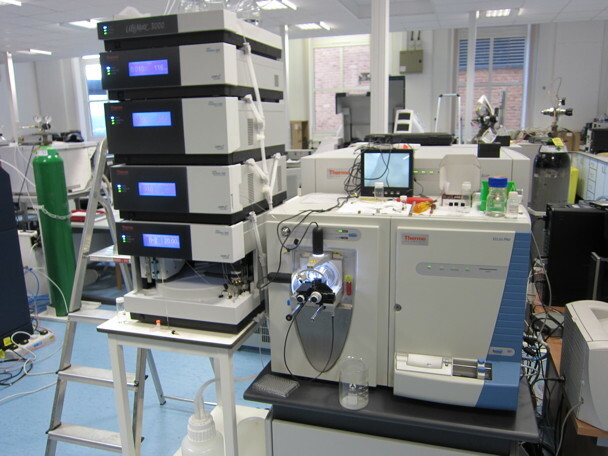 The system comprises a ThermoFisher Scientific Surveyor LC coupled via an LCIsoLink interface to a Delta V Plus isotope ratio mass spectrometer. 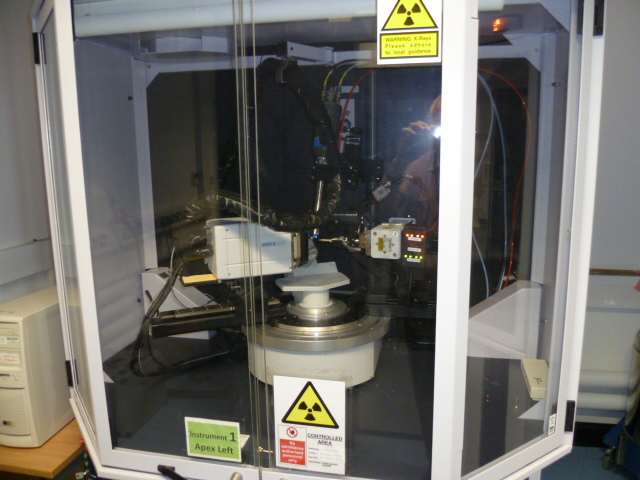 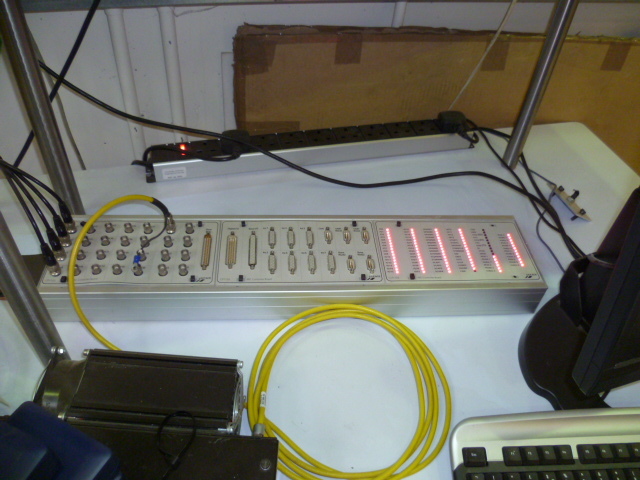 The Delta XP is capable of performing all of the analyses of earliar models but with improved electronics and enhanced computer control and automation. 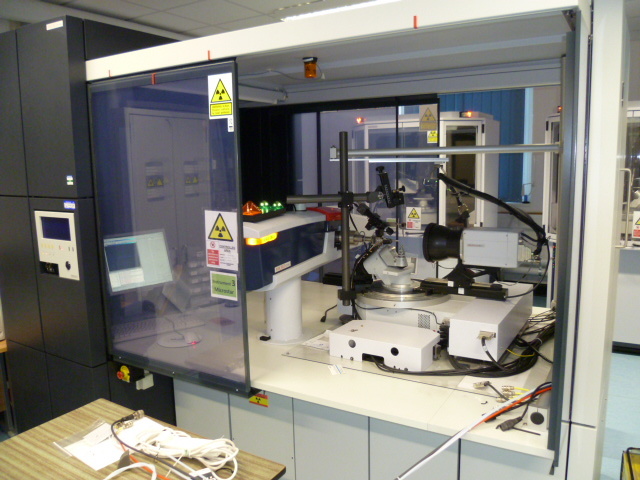 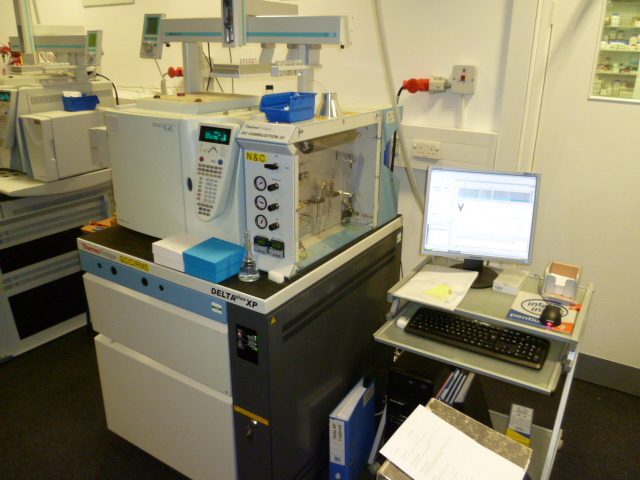 This particular instrument is interfaced, via a GCIII interface, to a ThermoElectron Trace GC equipped with a CTC GC Pal autosampler and is dedicated to compound specific Î´15N analyses. 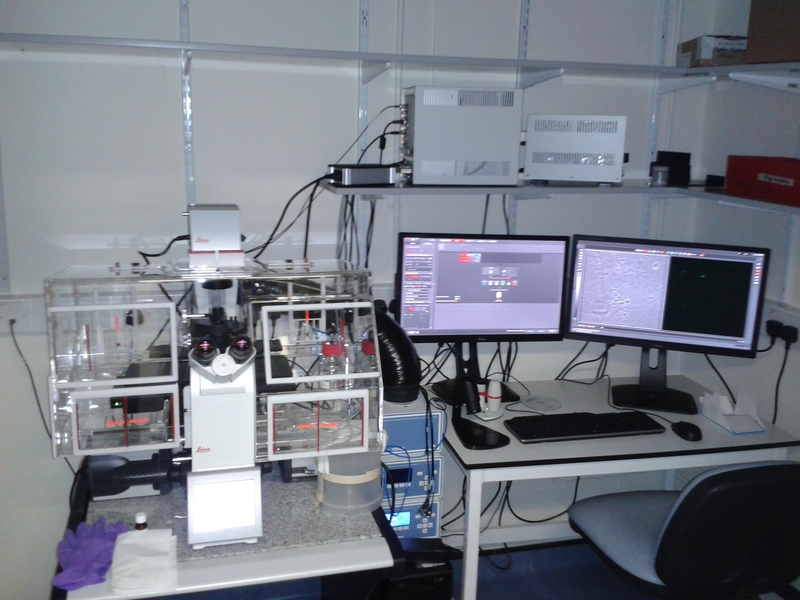 Leica confocal with one channel enabling sequential imaging of up to four fluorophores and phase contrast/DIC. 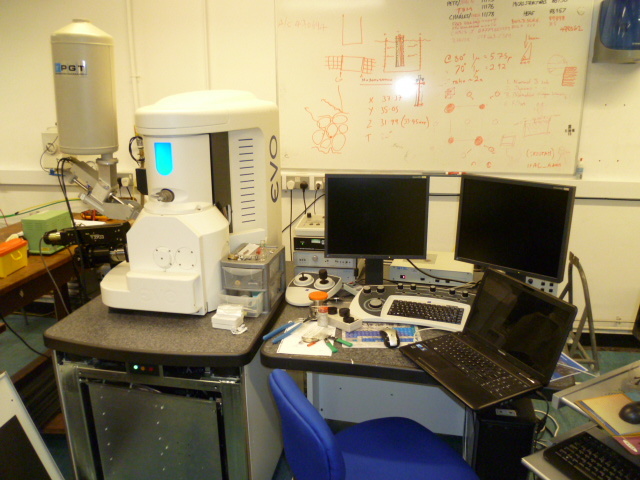 On a DMi8 inverted microscope and equipped with four lasers - 405, 488, 532, 633 nm. 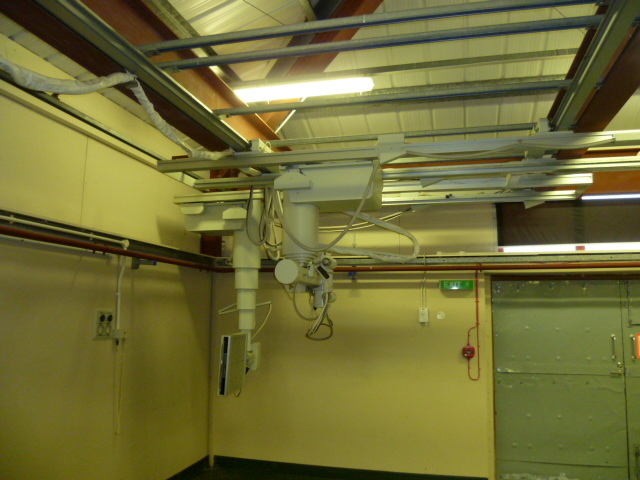 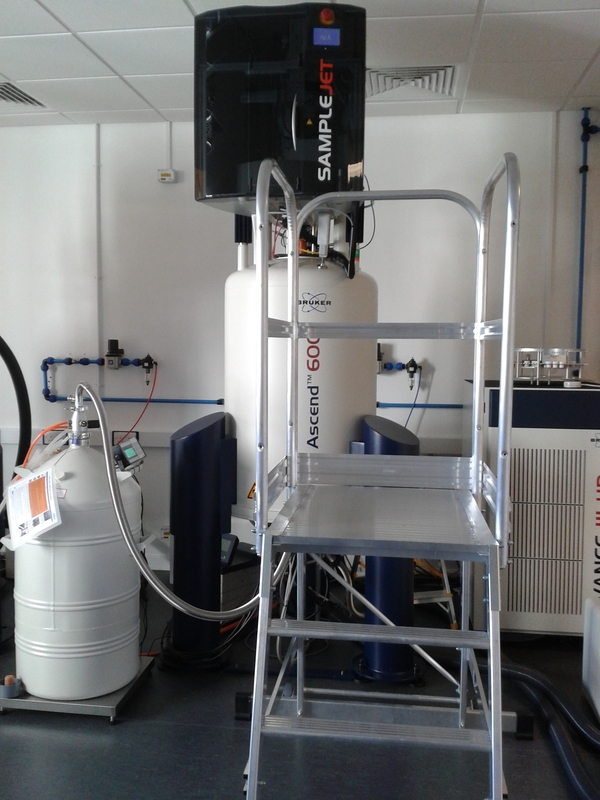 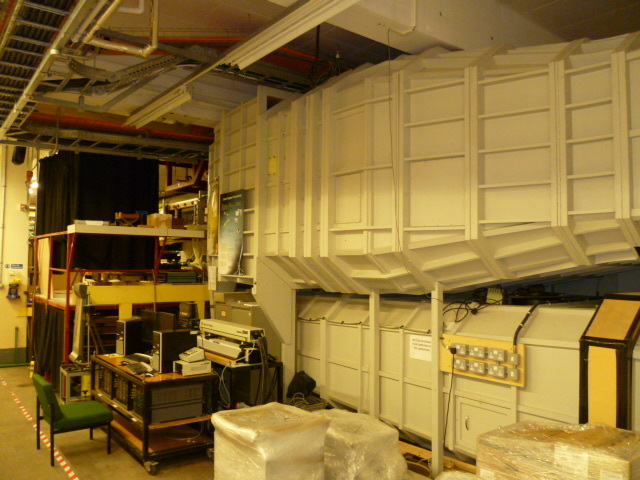 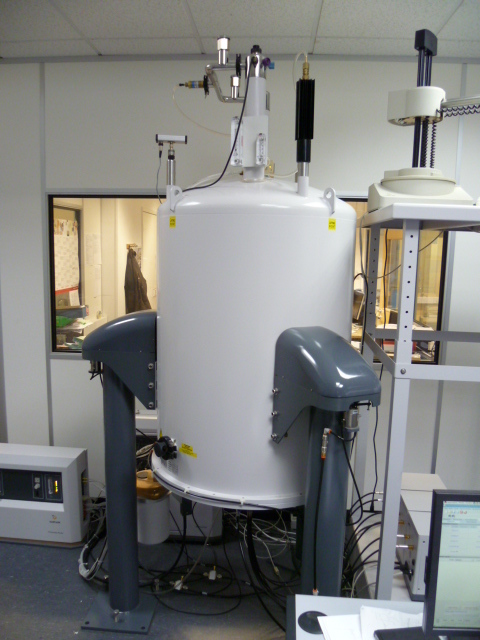 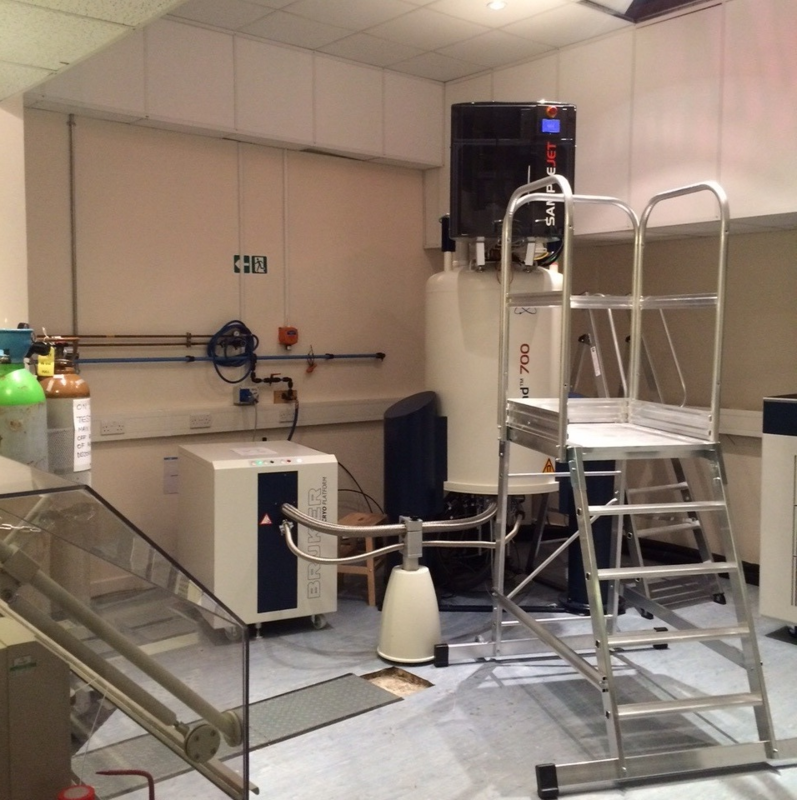 NMR Spectrometer at 700 MHz, solution state chemical NMR, Biological/Protein NMR. 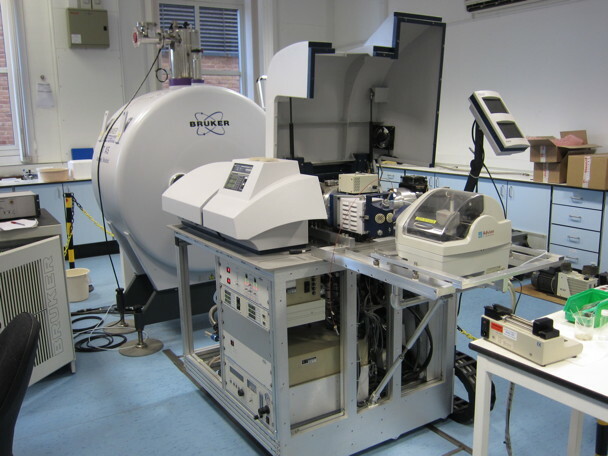 Equipped with a 1.7 mm Triple resonance cryo-probe. 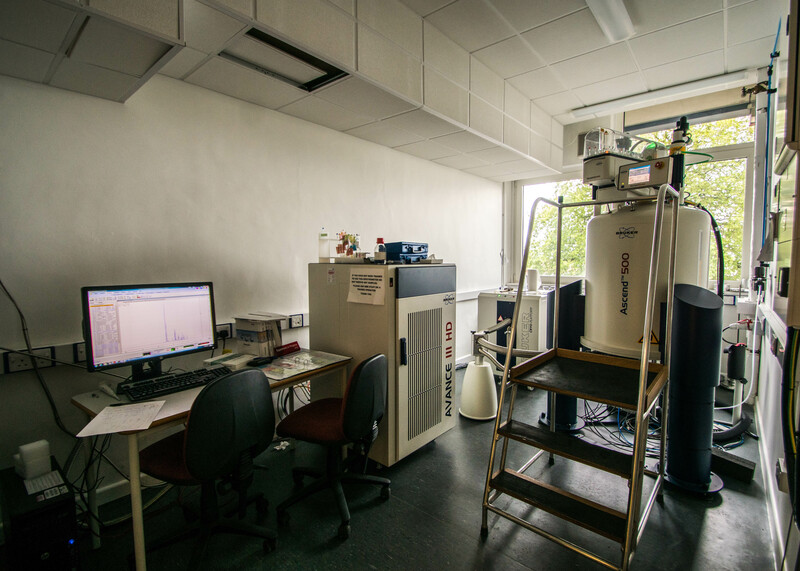 The signal to noise for proton on a standard ethyl benzene (0.1%) sample is equivalent to > 30000:1 by mass sensitivity compared to 6000:1 for our closest 1H sensitive instrument the cryo-600. 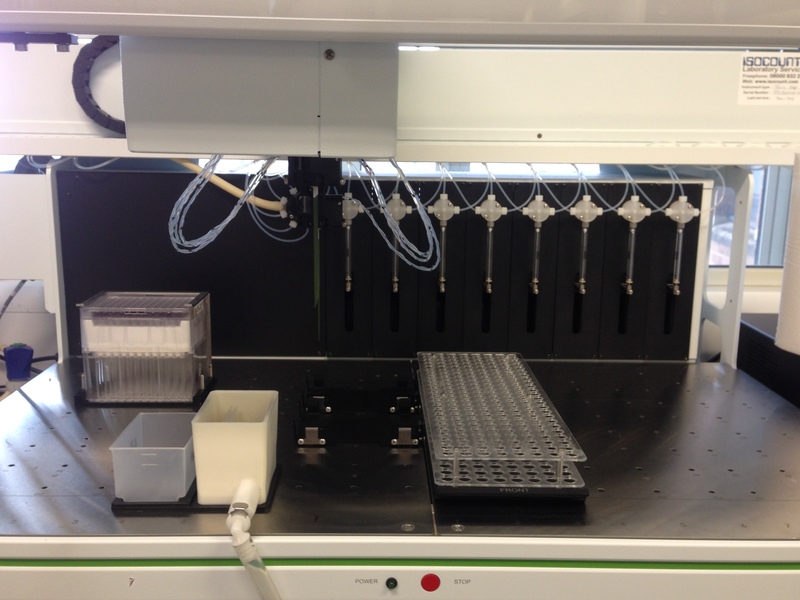 Liquid handling robotics platform for assay based work with integrated plate reader. 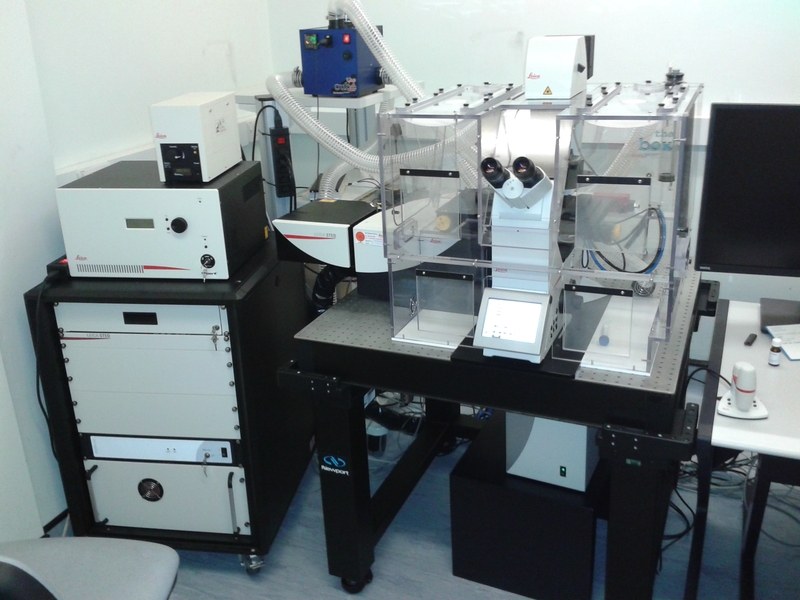 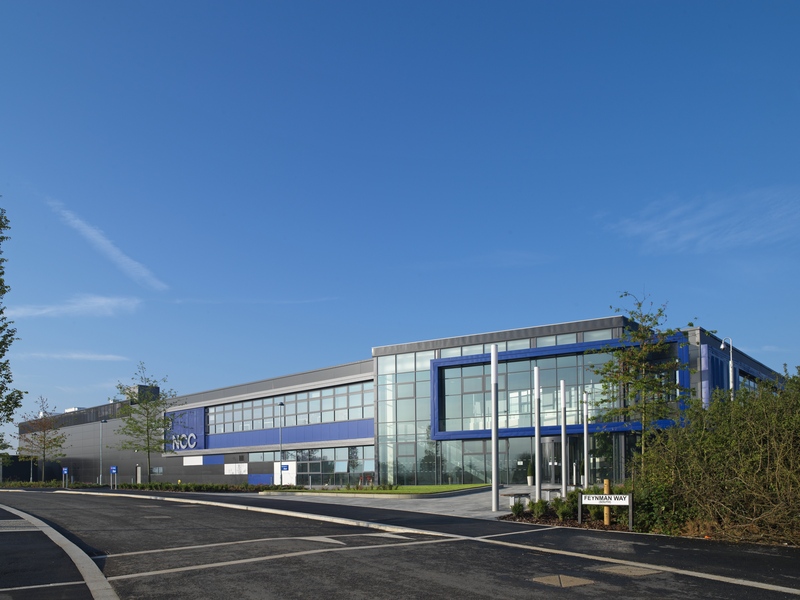 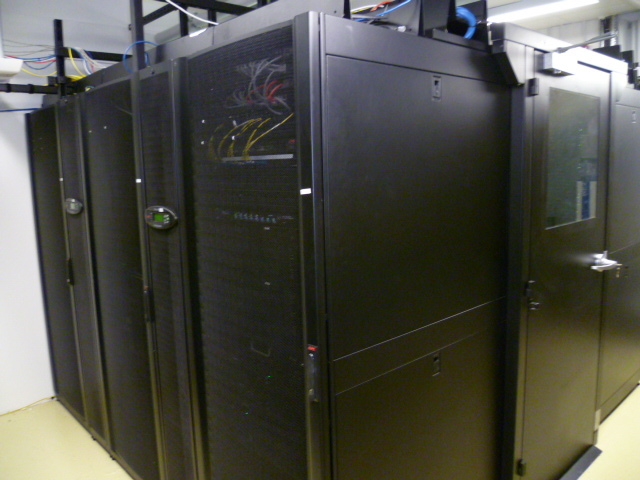 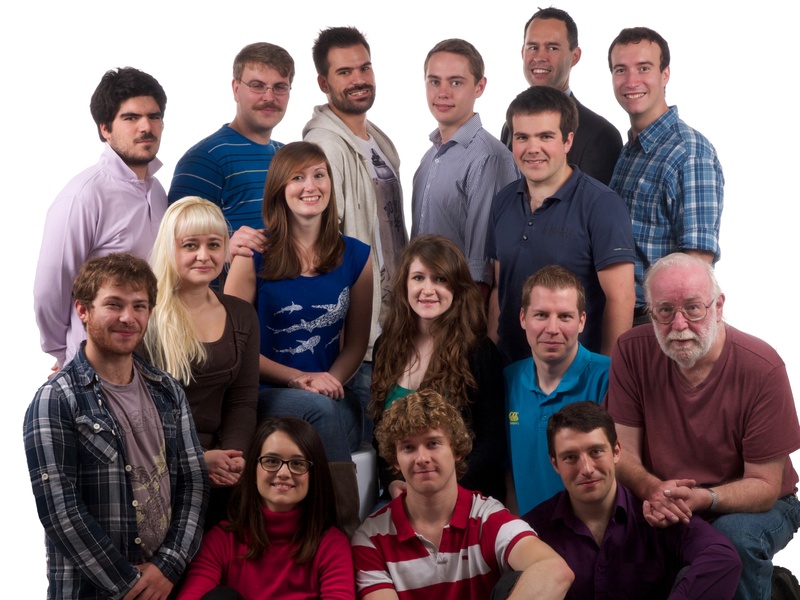 We house genomics and transcriptomics equipment and expertise accessible to both internal and external researchers. 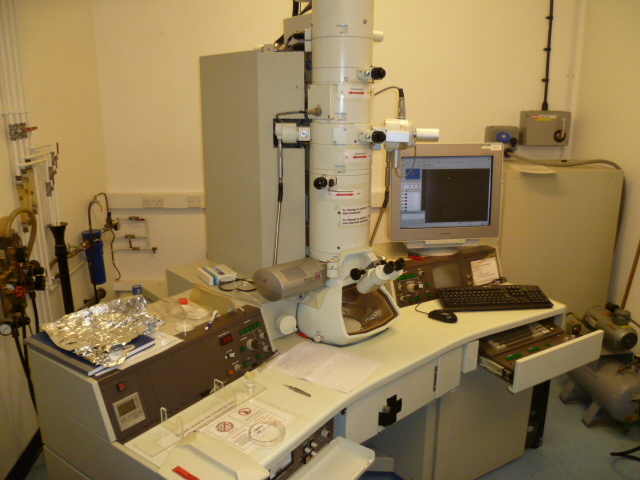 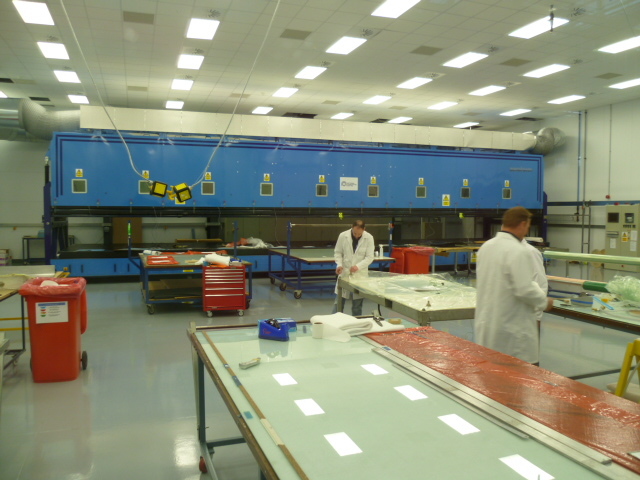 Preparation of thin film samples. 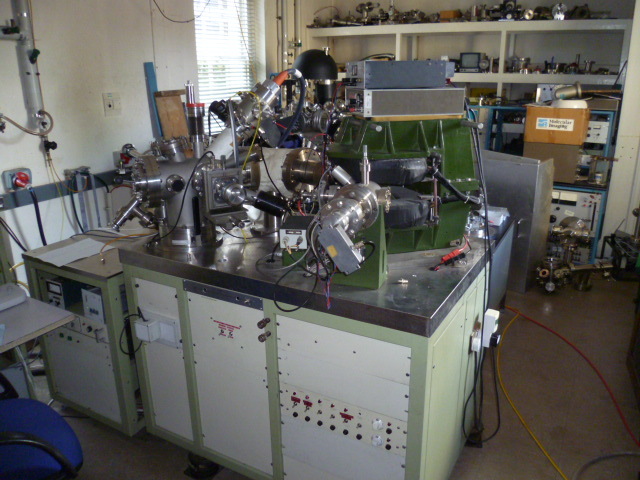 Chamber has four sputter guns for simultaneous deposition or sequential growth (heterostructures). 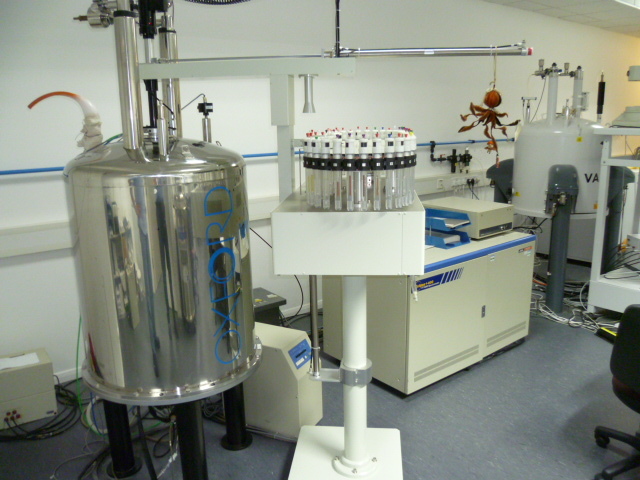 Deuterium and oxygen reactive gas species are used for oxide and deuteride film synthesis. 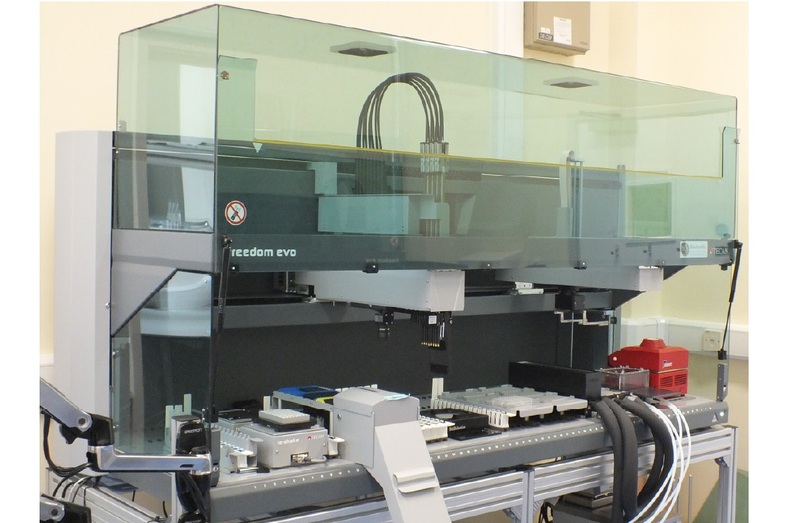 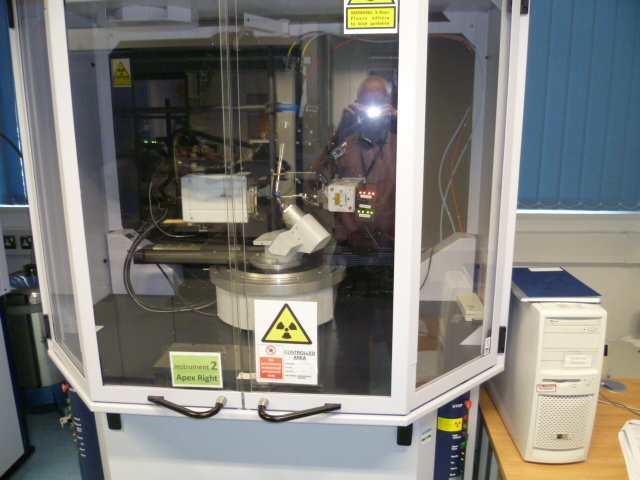 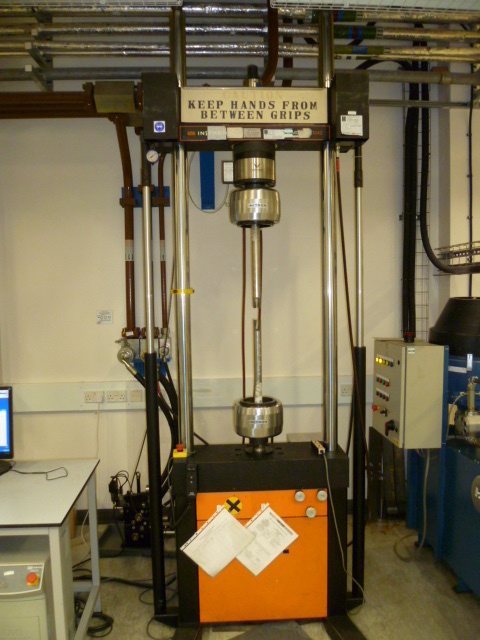 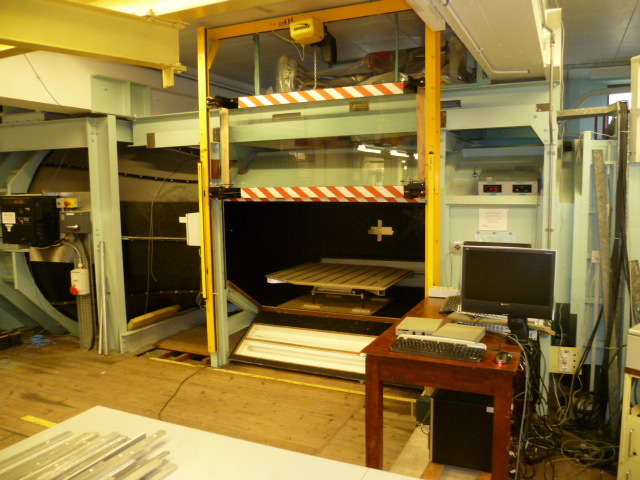 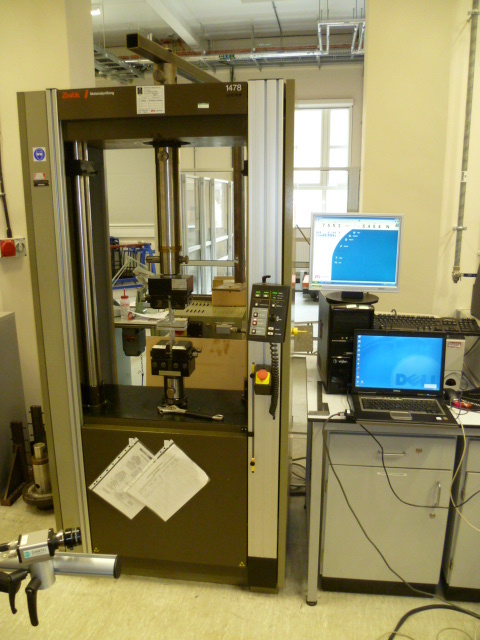 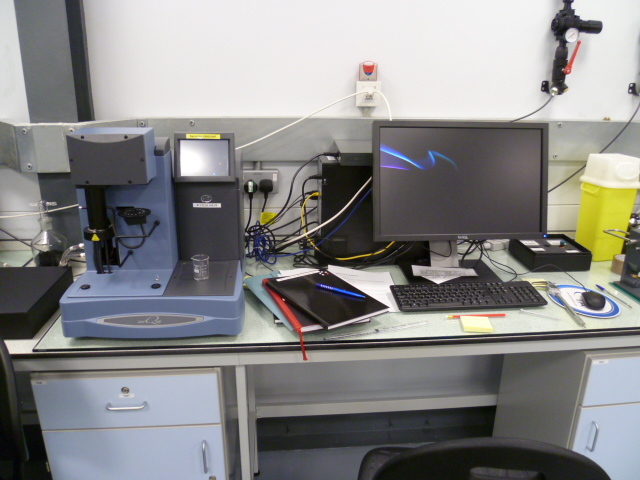 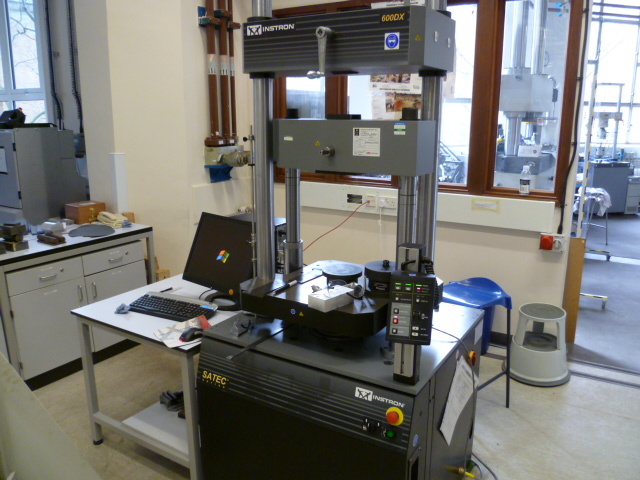 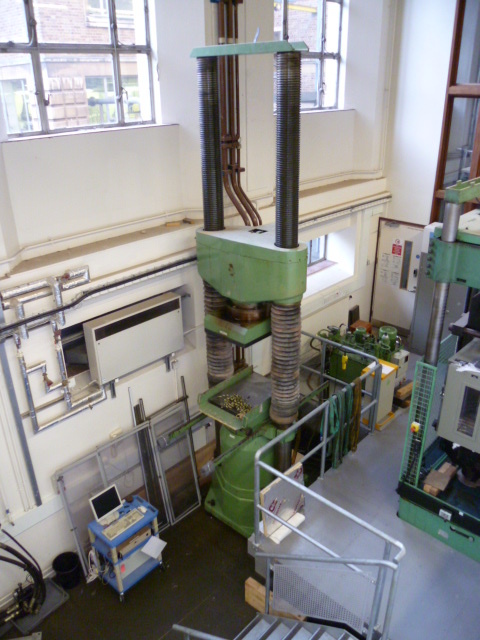 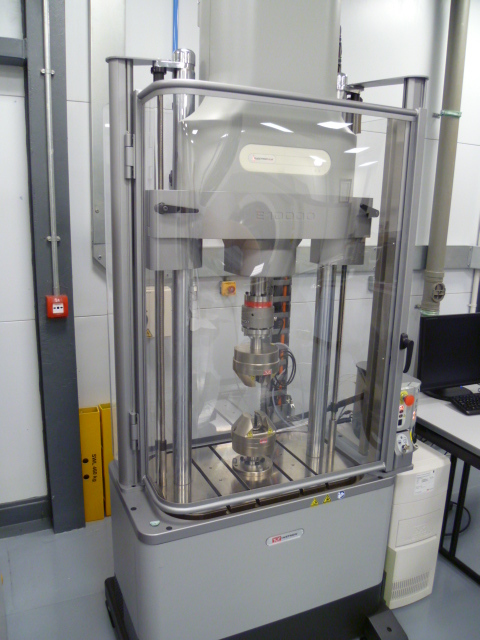 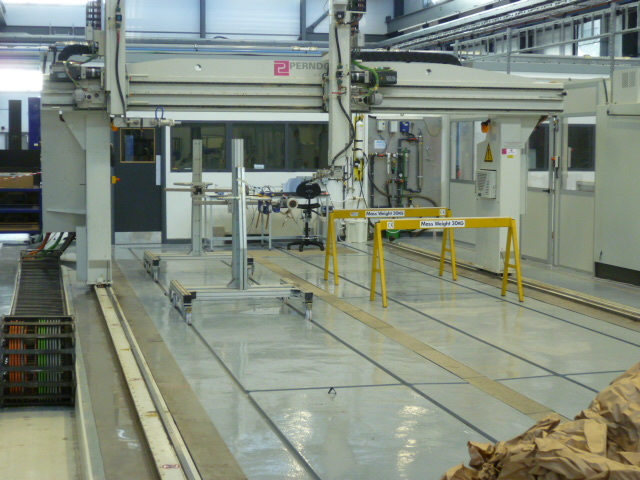 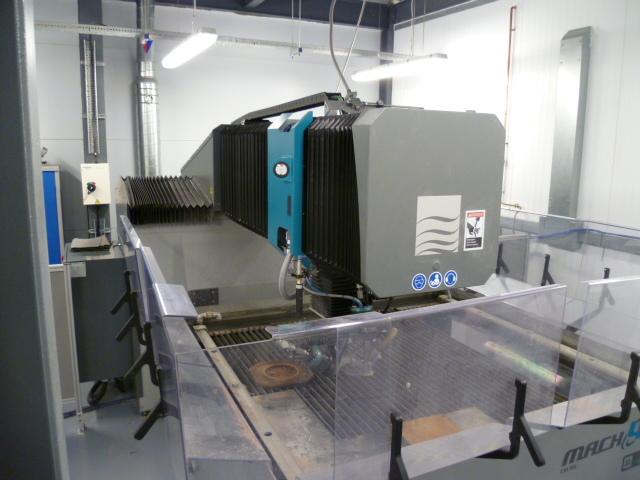 The system is equipped with several in-situ characterisation tools, including a quartz crystal balance, IGA and RHEED analysis. 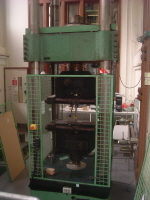 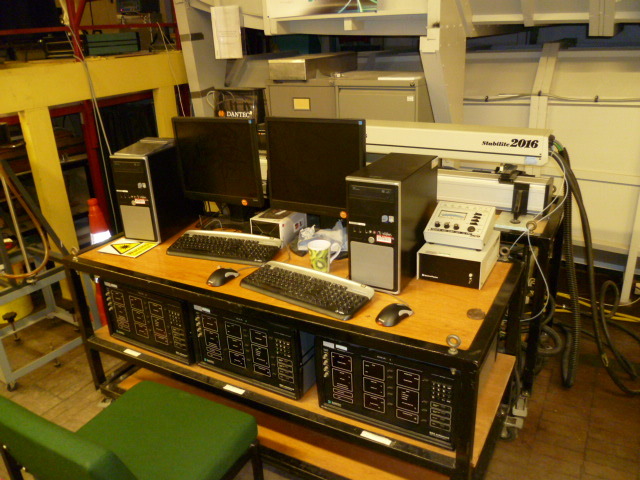 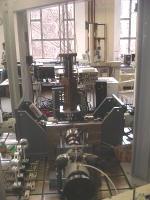 Fourier transform ion cyclotron resonance mass spectrometer. 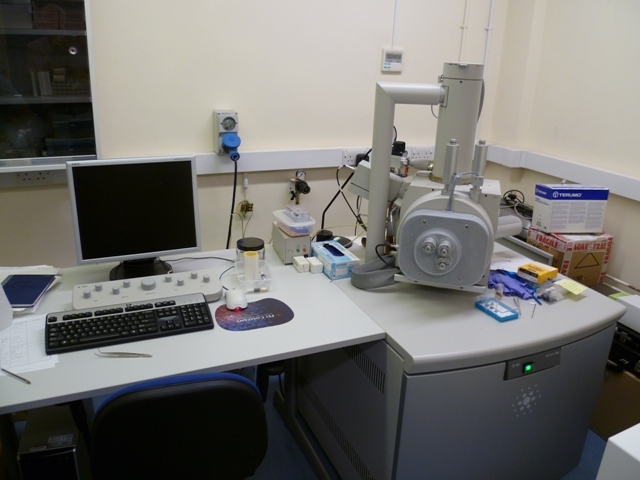 High sensitivity and spatial resolution qualitative analysis of surface elemental & molecular composition, imaging, depth profiling, high resolution ion milling.